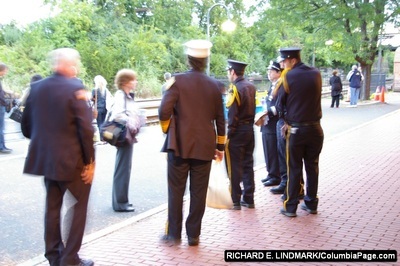 September 11, 2009 at 04:45 A.M my alarm clock goes off. 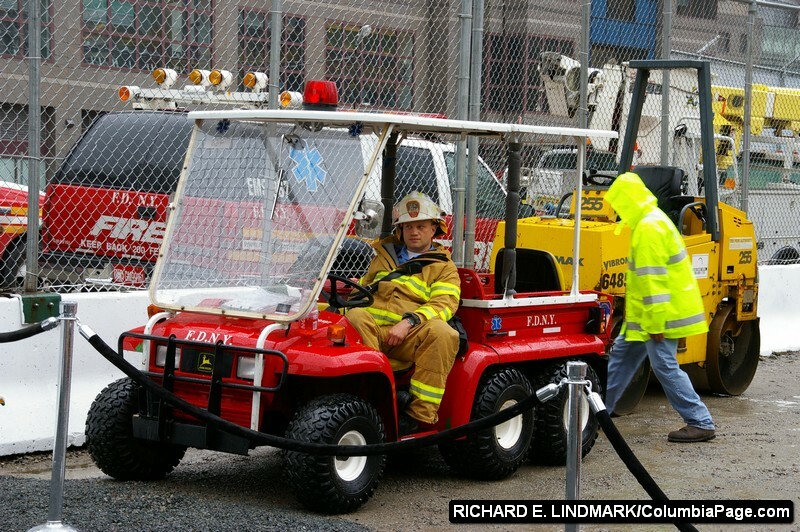 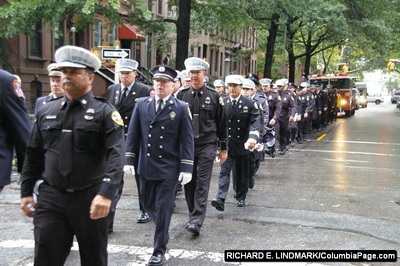 I rollover to turn it off and it hits me, 343 New York City Firefighters aren't able to due such a simple task. 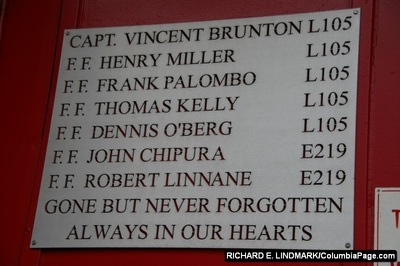 They were murdered on September 11, 2001. 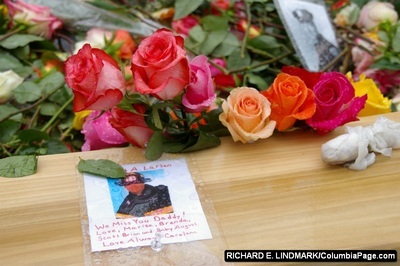 Murdered. 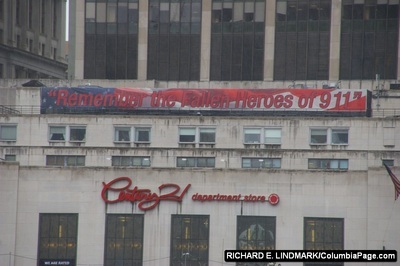 Yes, murdered by terrorists. 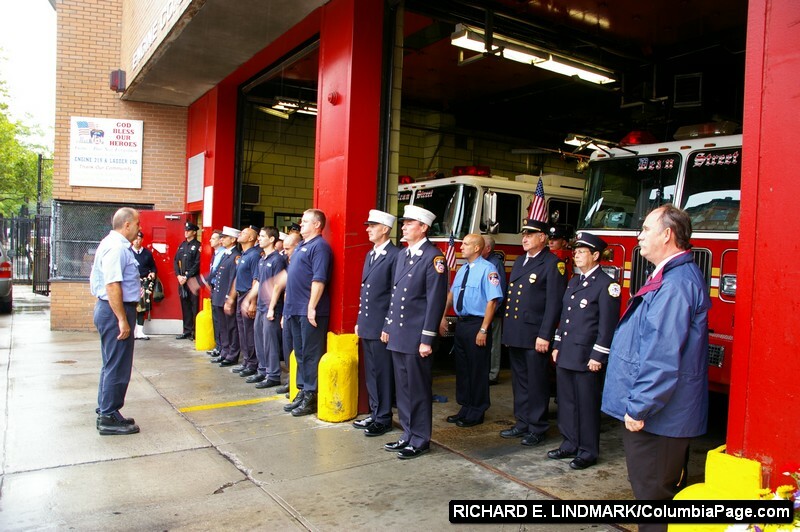 I put on my dress uniform and head to the East Chatham Fire Station to meet with other firefighters. 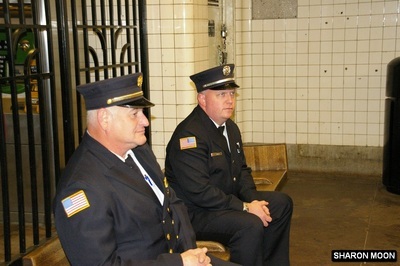 At the station I meet up with East Chatham 1st Assistant Chief Alan Besterman, and East Chatham Firefighters Willy Moon, Lee Pratt and James Ordway. Also there is fellow Canaan Firefighter Sharon Moon. 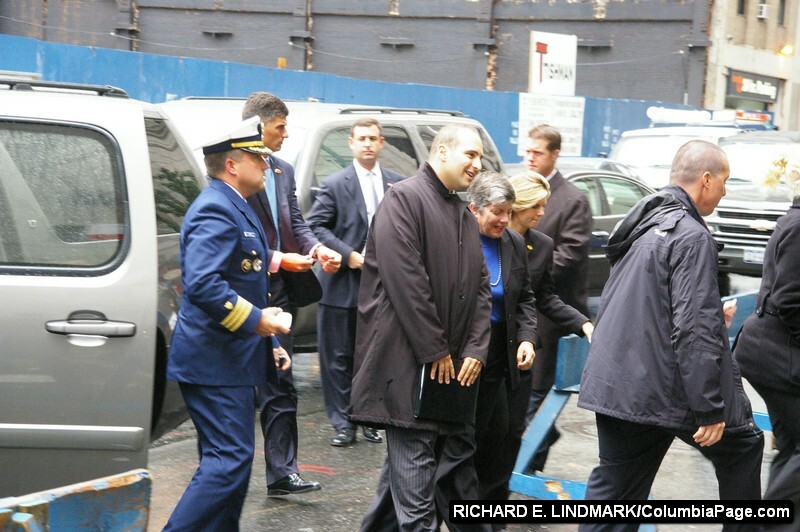 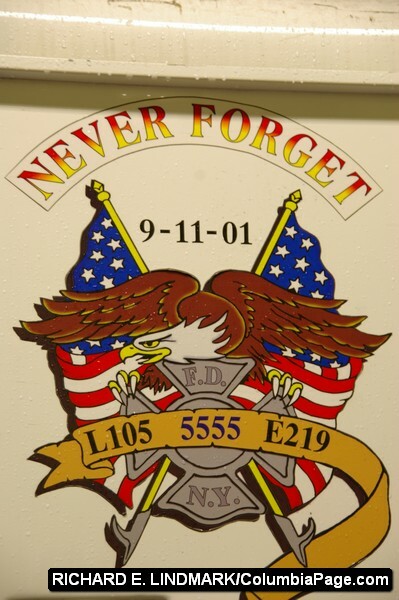 We are going to New York City to pay respects to 343 brothers who were killed eight years ago at the Twin Towers in lower Manhattan. 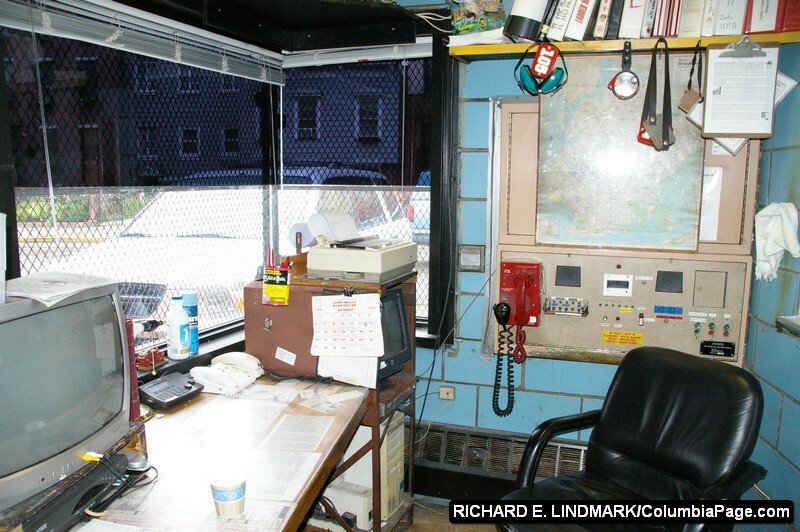 We drive to Hudson to catch the 5:45am Amtrak train to Penn Station. 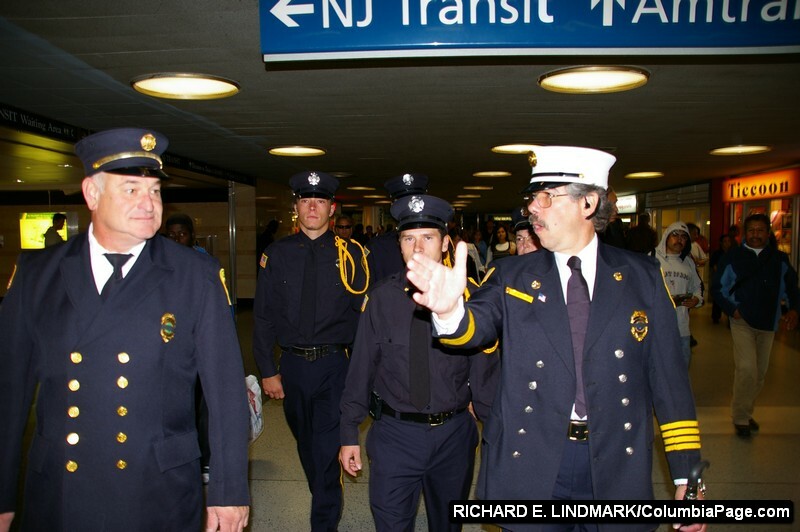 As we board the train we are greeted by smiles and everyday people saying, thank you. Two hours later we arrive at Penn Station. 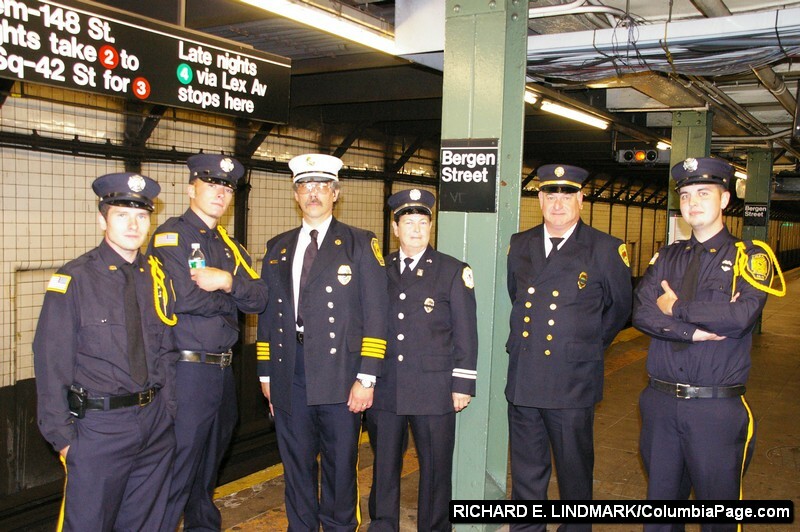 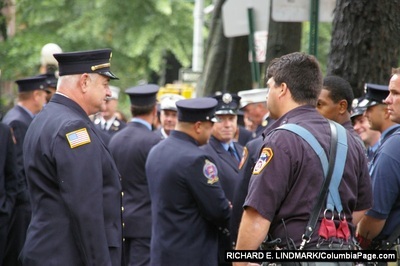 We must look lost because a FDNY Captain comes over to us and asked if we know where we are going. We do. He then assists us with getting Metro cards to ride the subway to Brooklyn. We thank him and he thanks us for coming and goes on his way. In the station and while on the subway people continue to smile at us and thank us. They thank us for coming to New York City and for what we do. 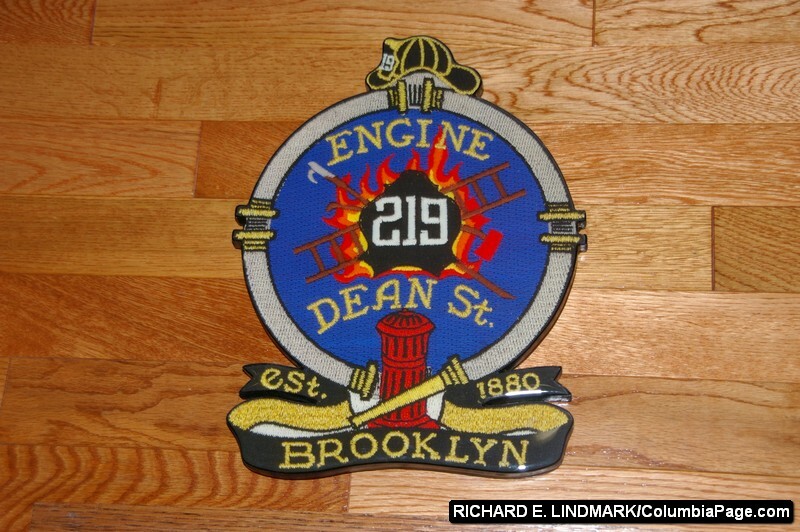 We arrive in Brooklyn and start walking to 494 Dean Street. 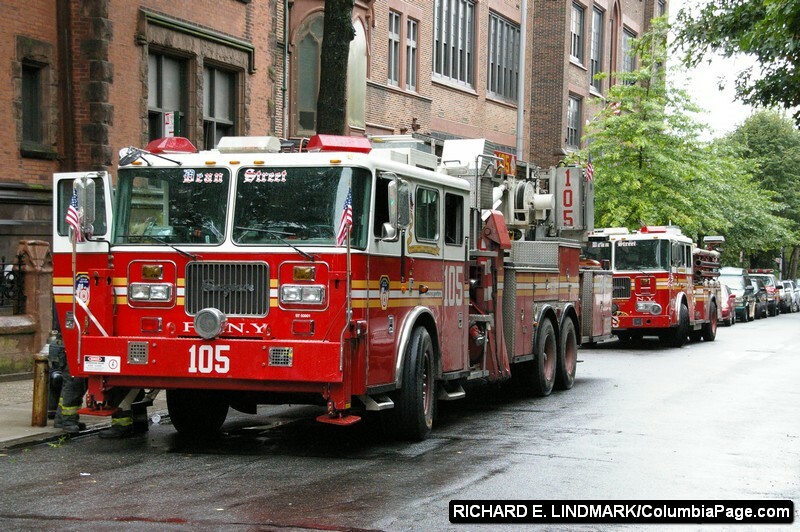 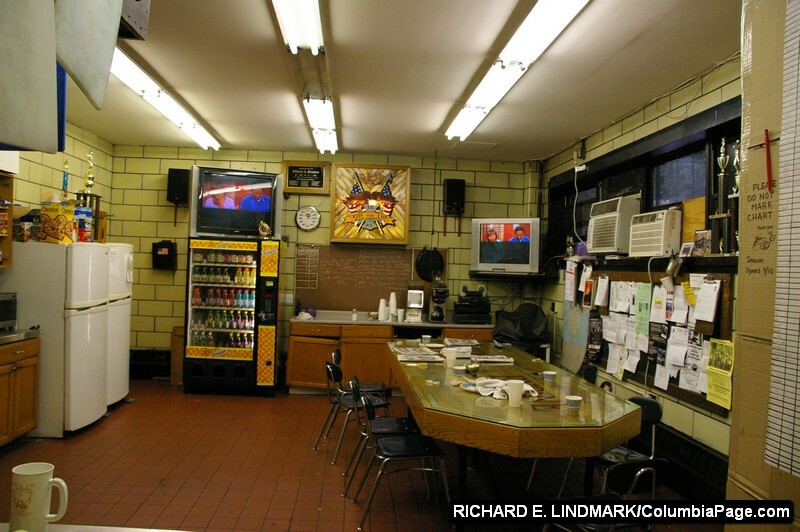 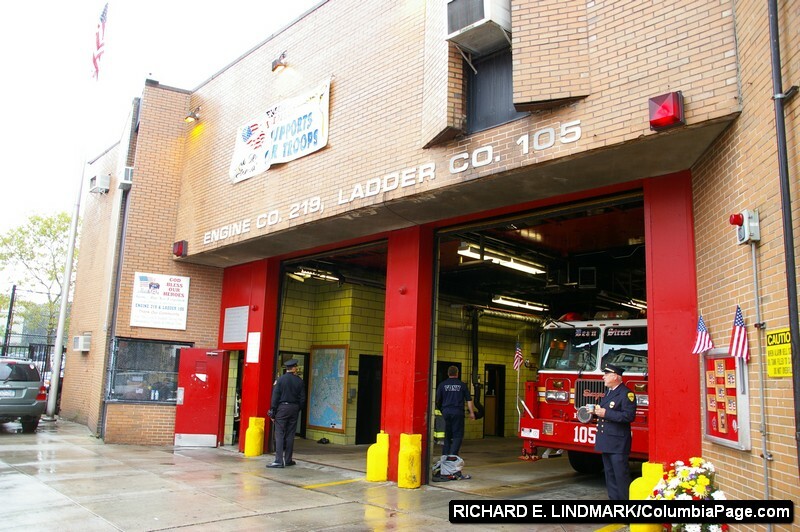 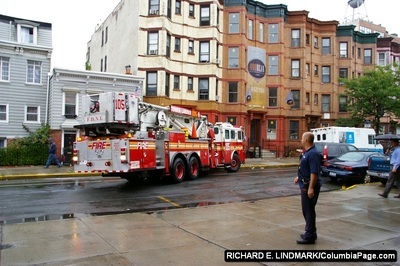 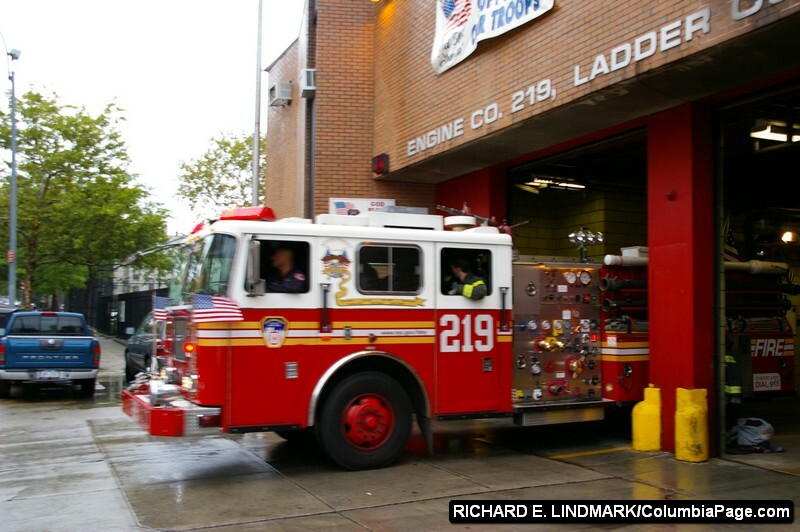 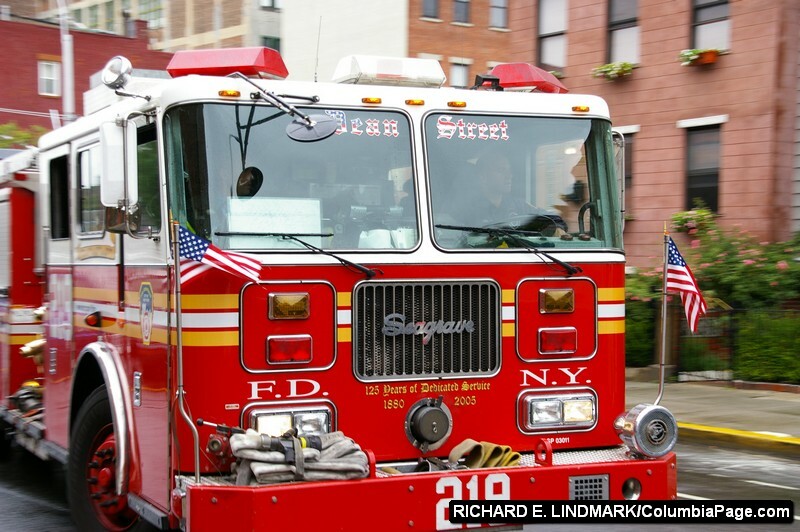 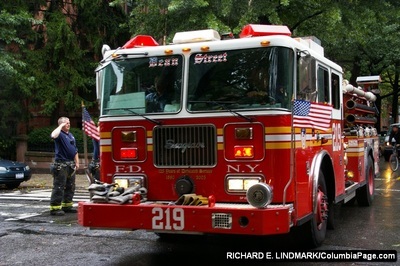 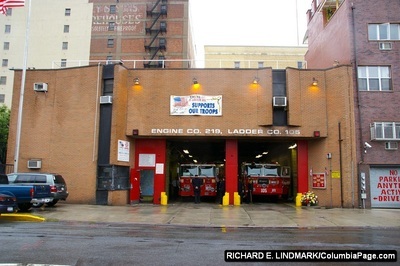 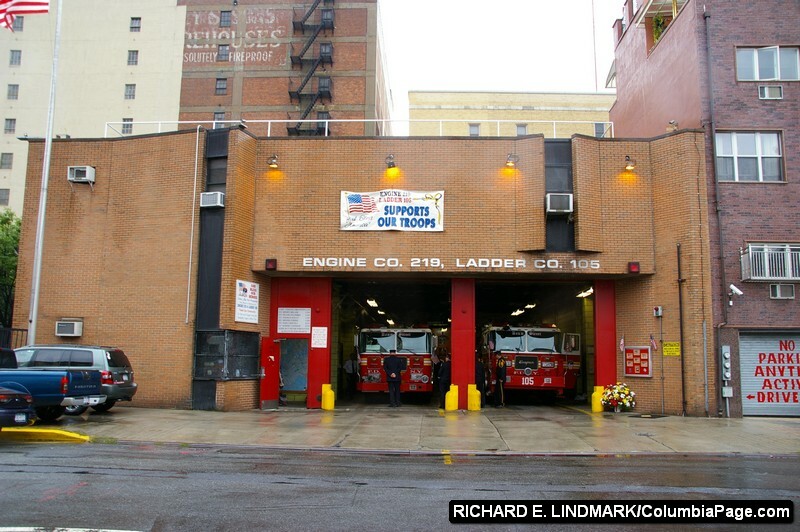 It is the home of Engine 219 and Ladder 105 of the New York City Fire Department. We were invited there by FDNYFirefighter Regina Wilson. 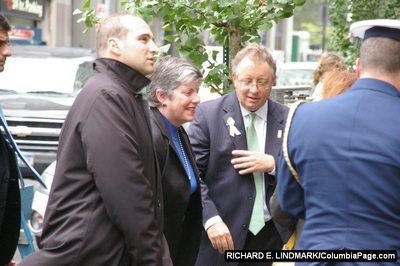 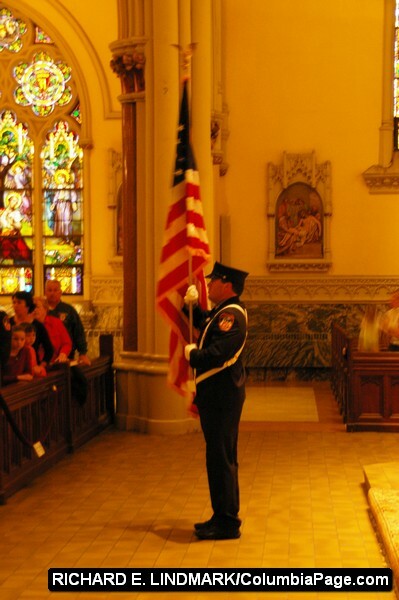 We met her at the New York State memorial service in Albany last October where she sang the National Anthem. 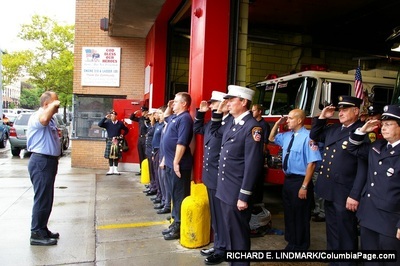 She has an awesome voice. 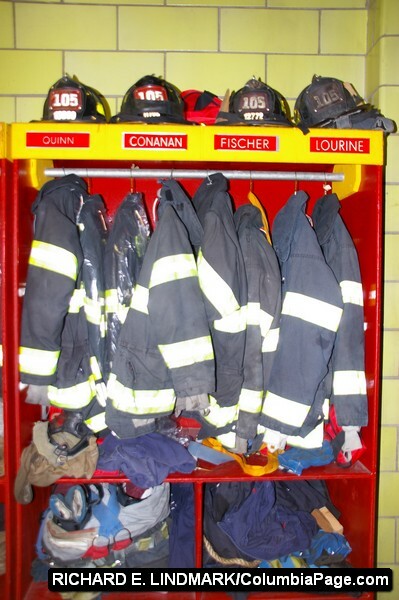 We arrived at the Fire Station and immediately feel at home. 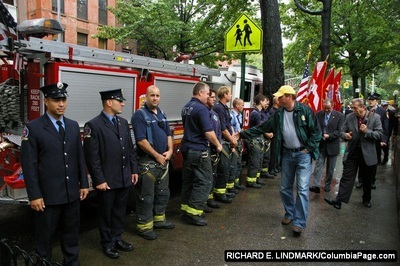 Firefighters come forward to say hello and offer us coffee and something to eat. 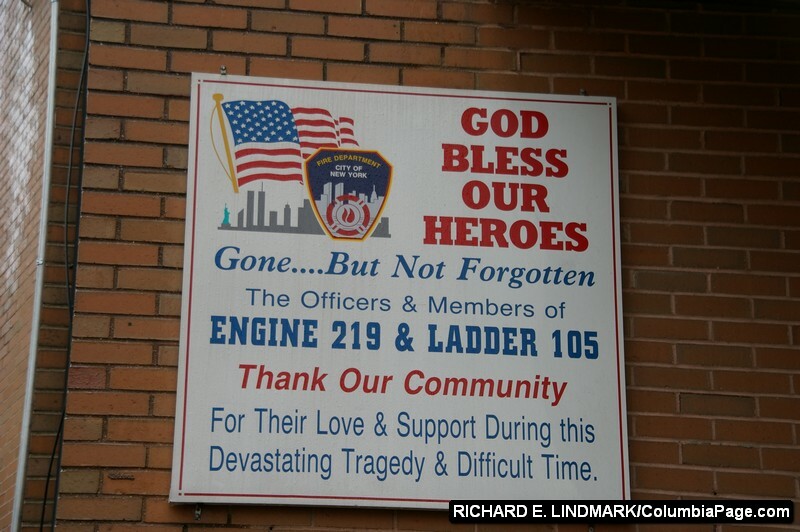 They also thank us for coming. We are given a tour of the firehouse. 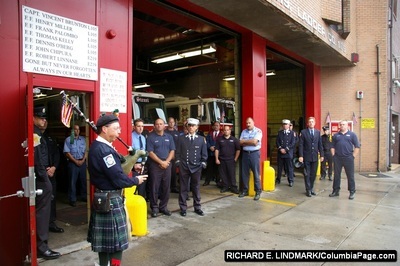 We then hear the orders for the firefighters to line up in front of the station. We join them. 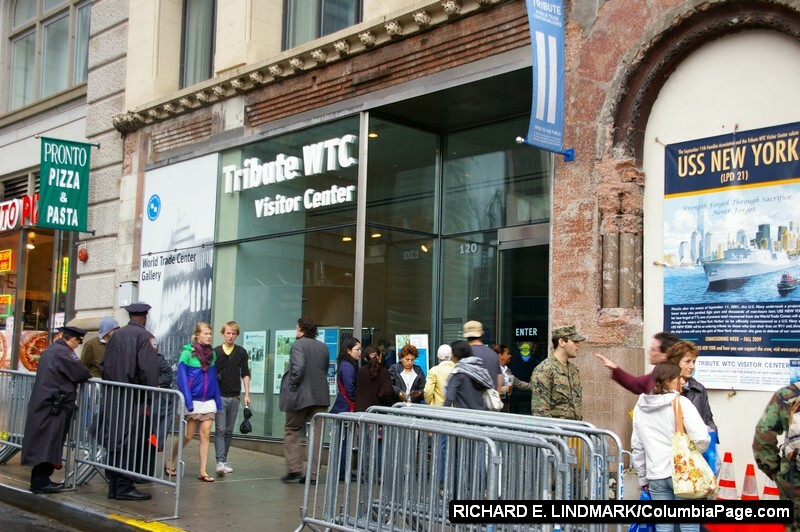 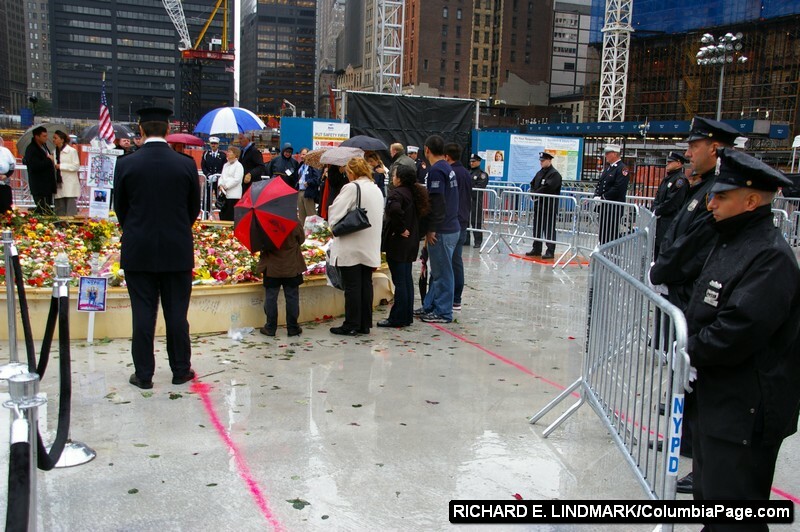 We join them to mark the time when the south tower collapsed. 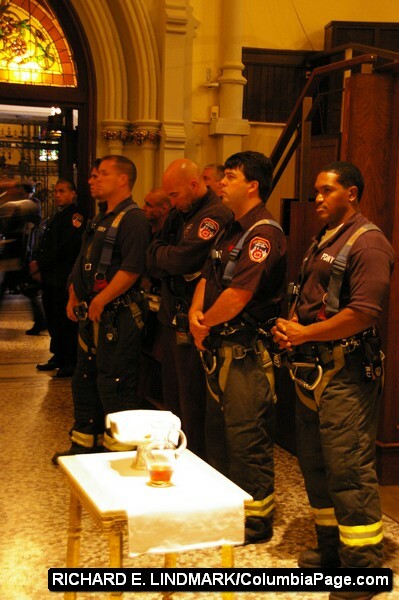 We are called to attention. 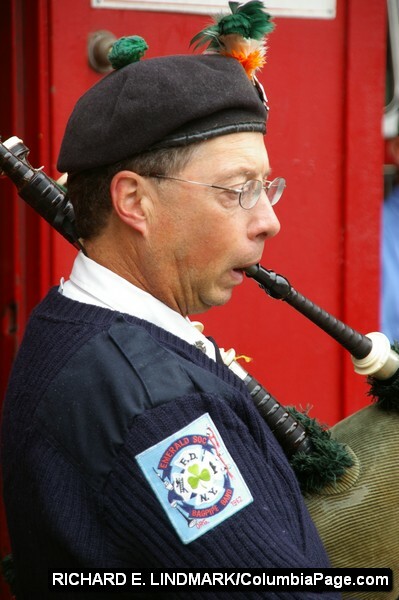 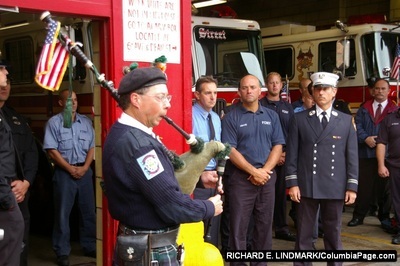 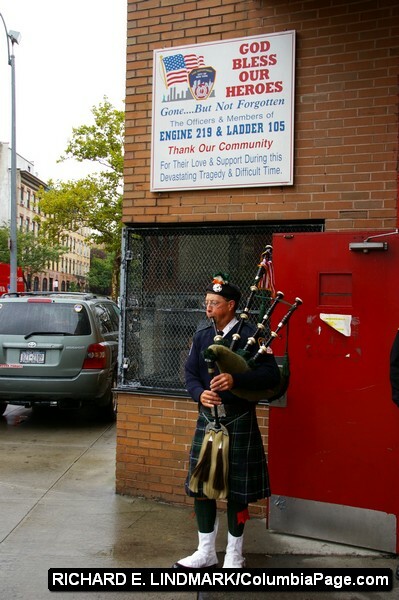 There is a moment of silence, a prayer, and a song by a lone bagpiper. 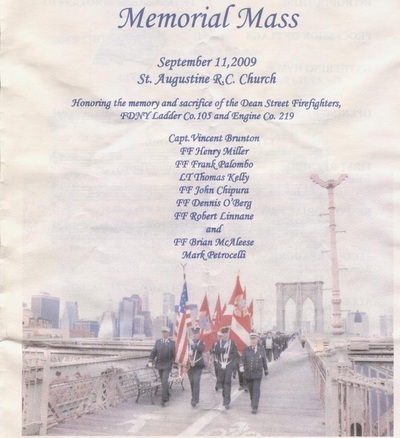 After the moment of silence we head to the St. Augustine R.C. 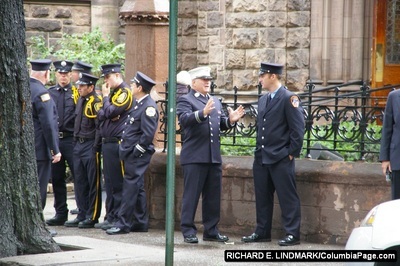 Church on 6th Avenue a few blocks from the Dean Street fire station. 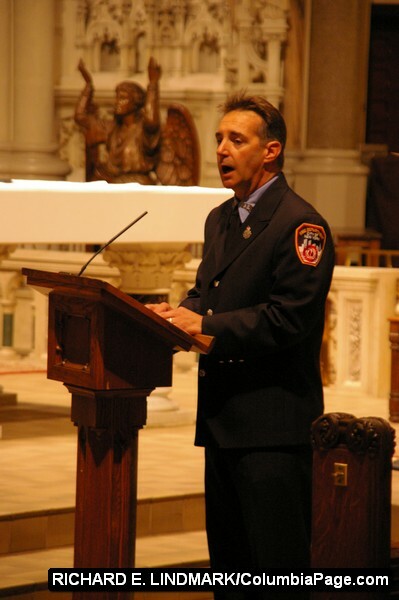 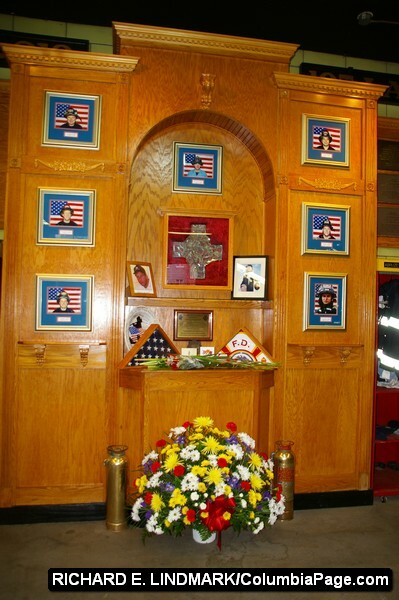 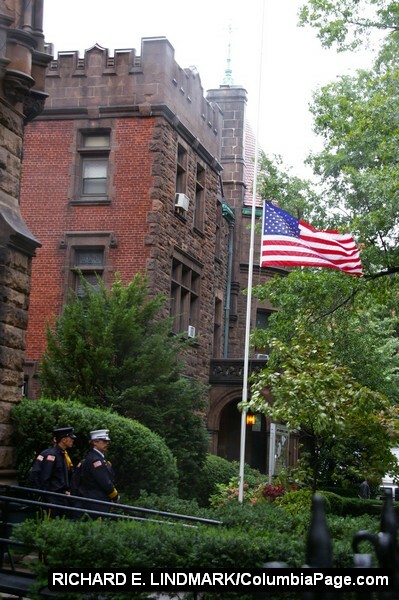 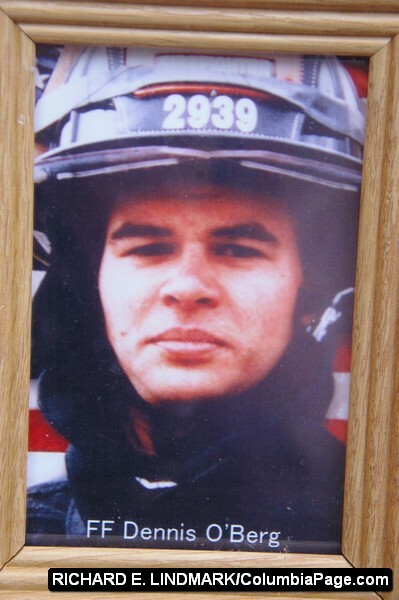 We go for a memorial mass to remember the lives and service of seven firefighters that served at Engine 219 and Ladder 105 who never came home from the Twin Towers. 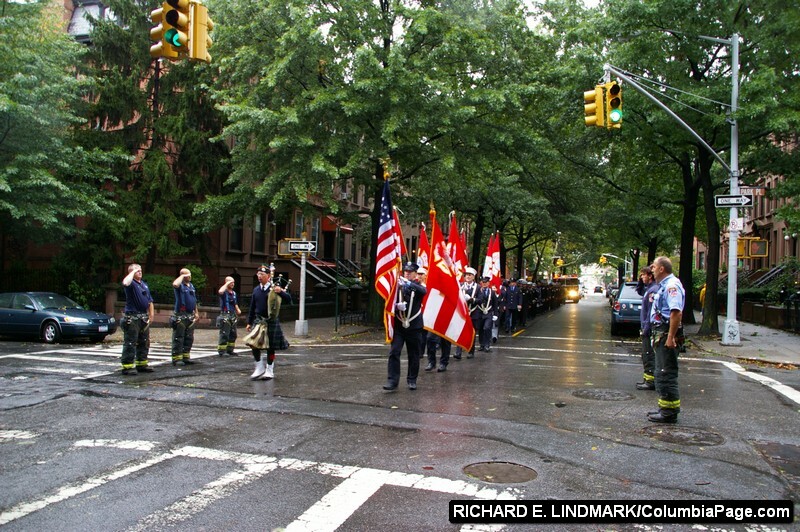 We observe the Parade of Flags. 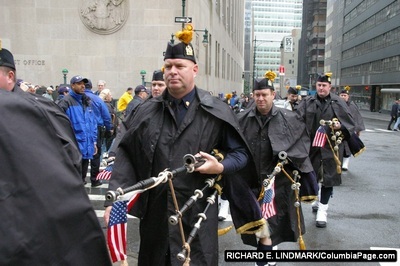 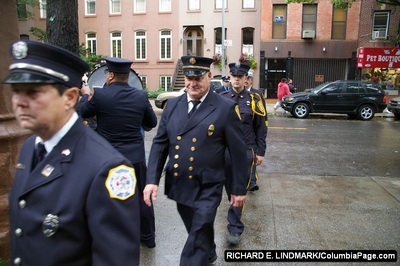 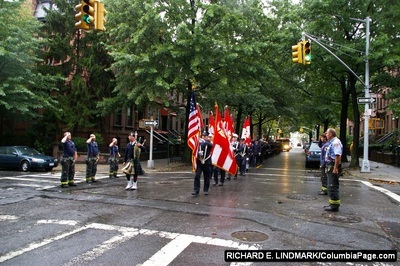 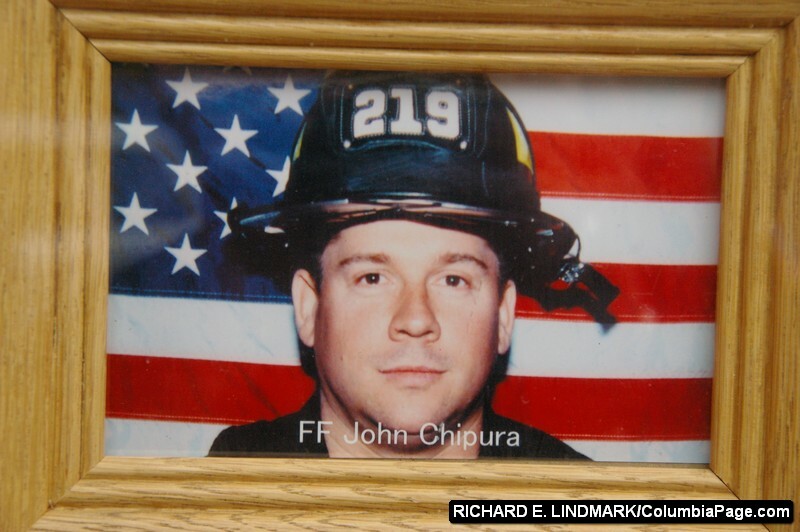 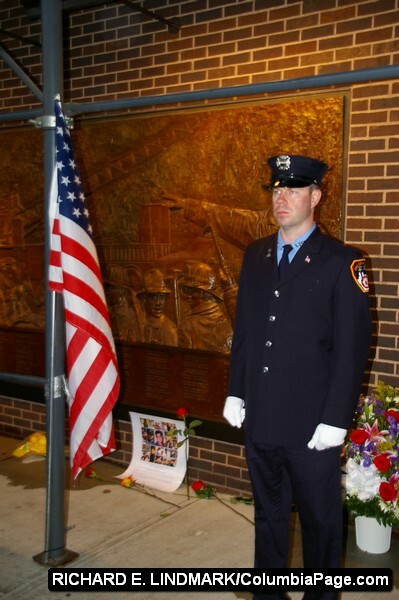 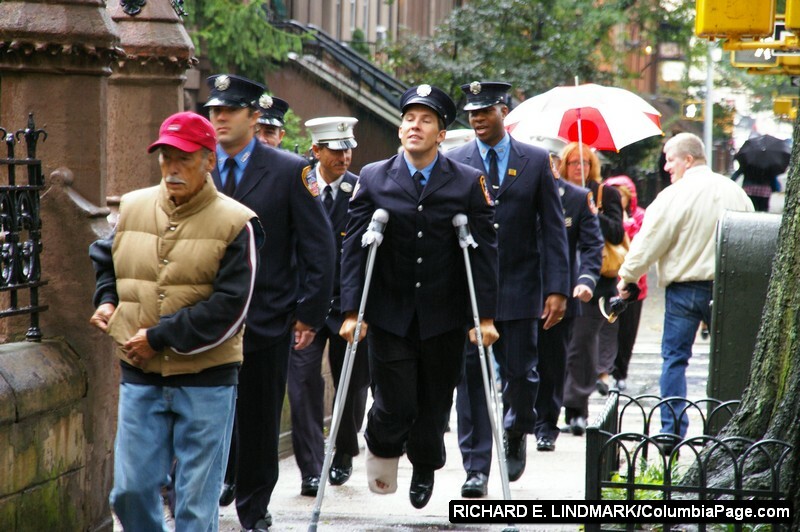 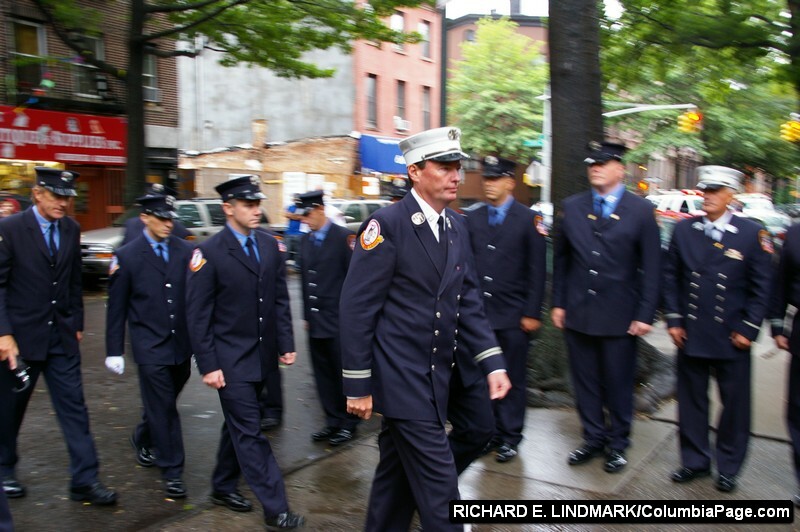 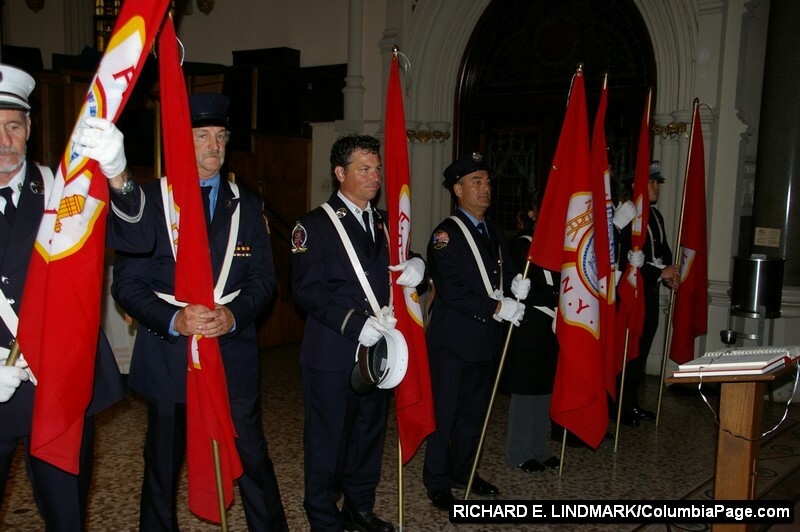 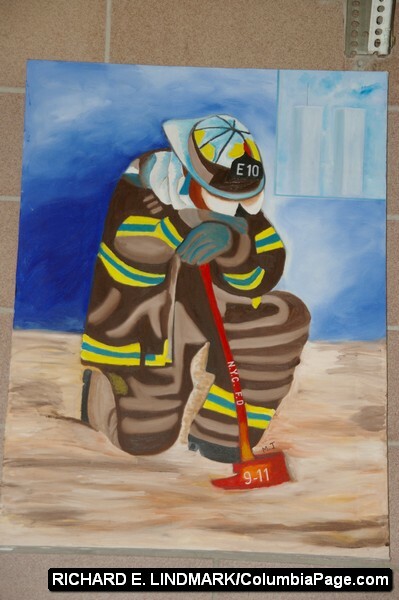 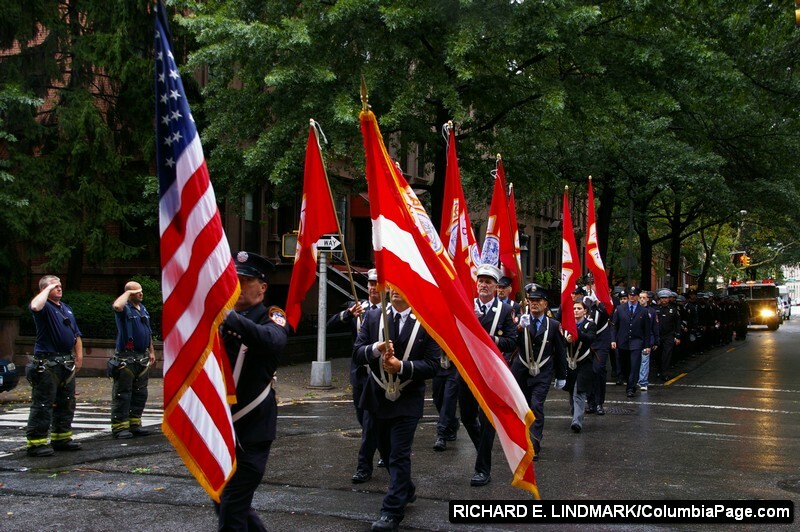 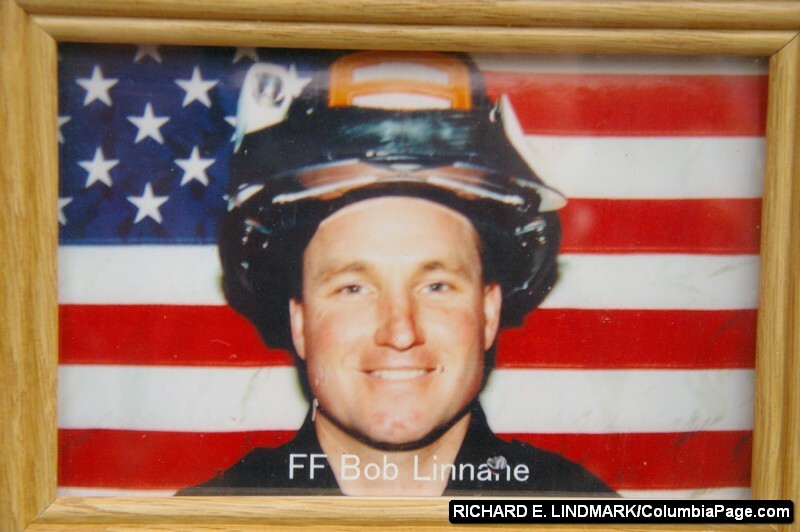 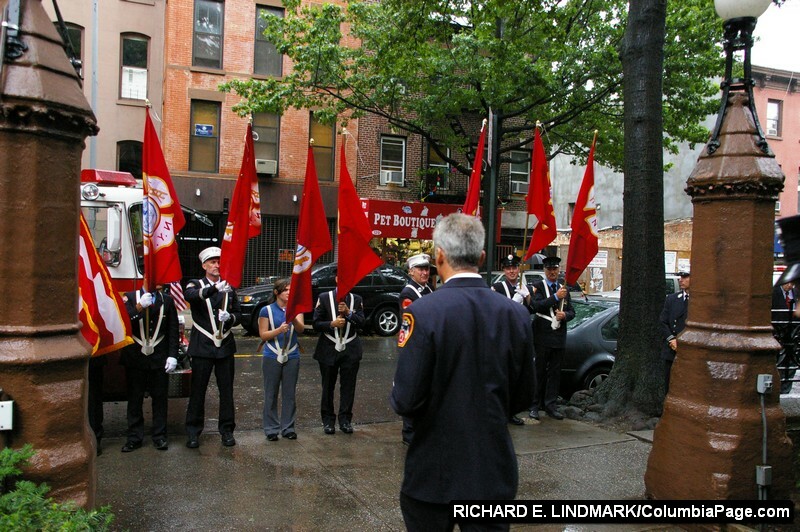 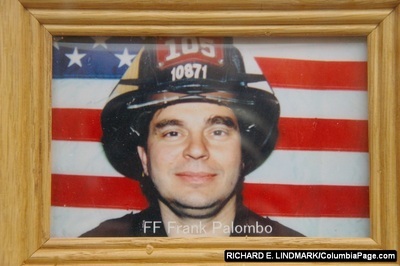 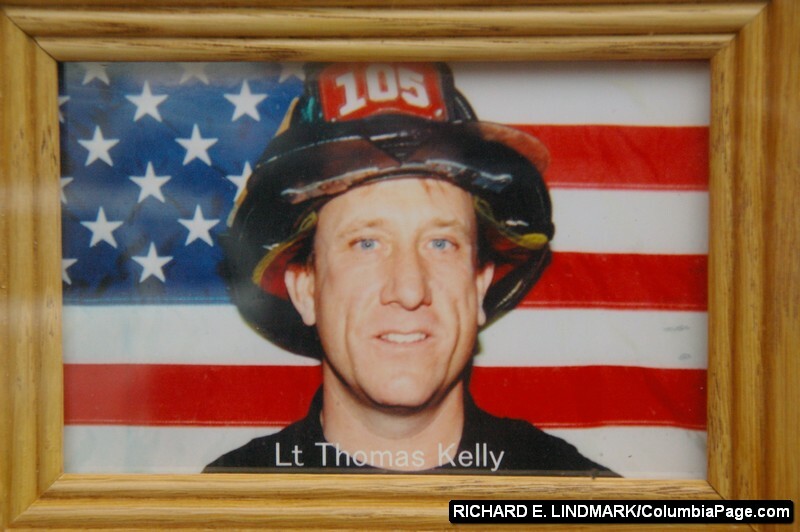 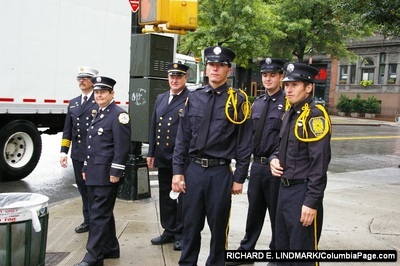 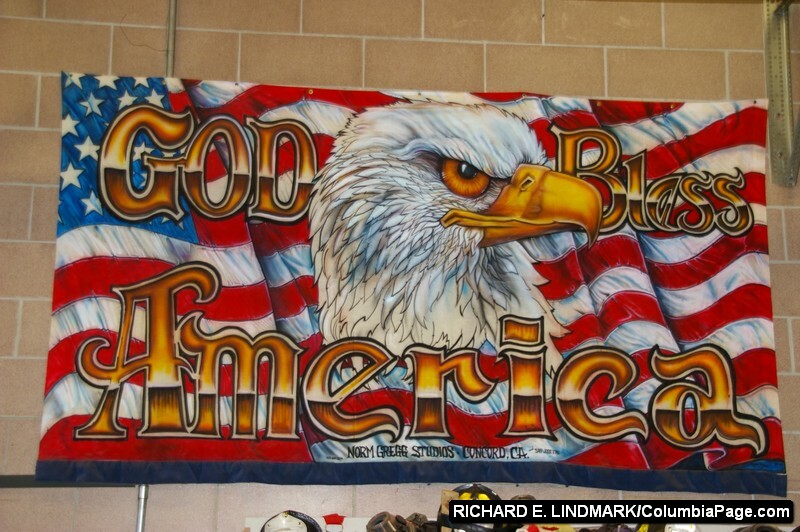 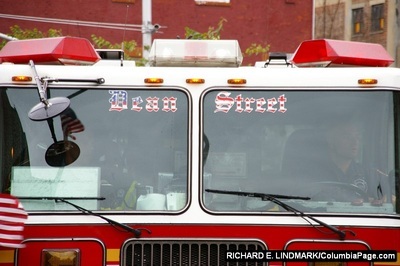 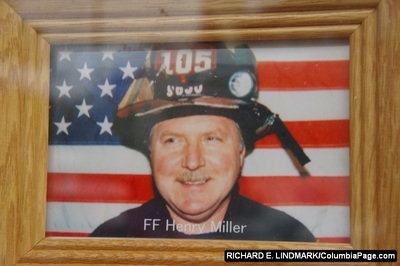 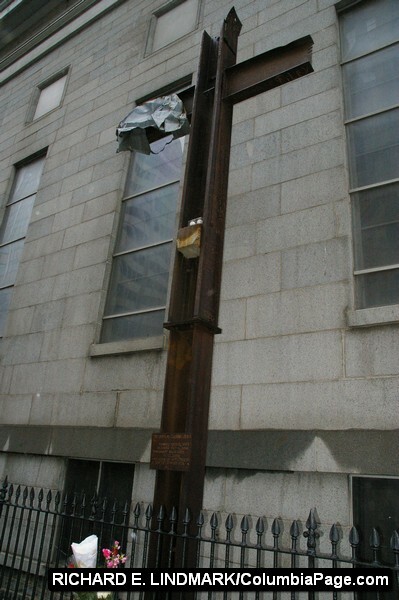 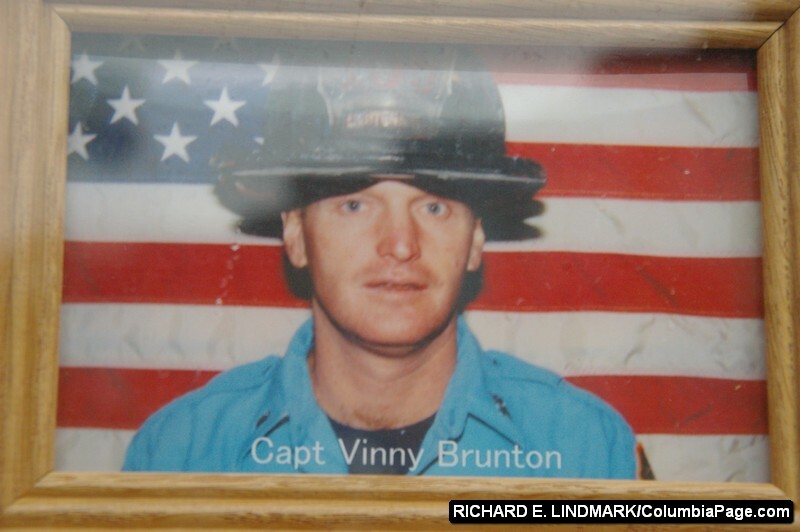 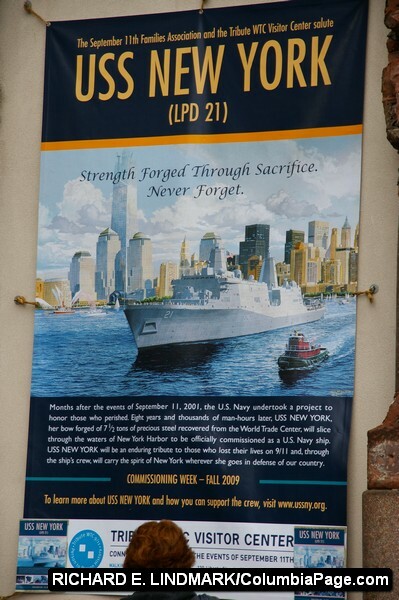 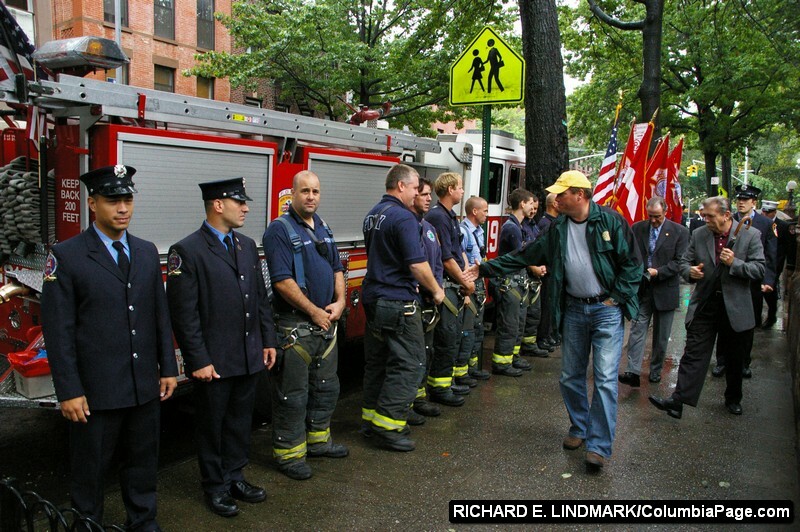 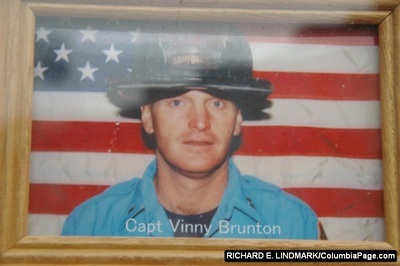 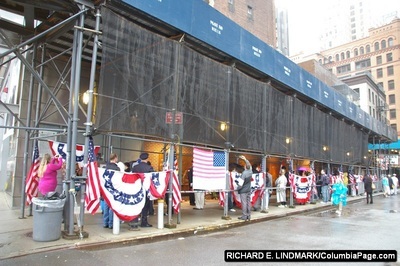 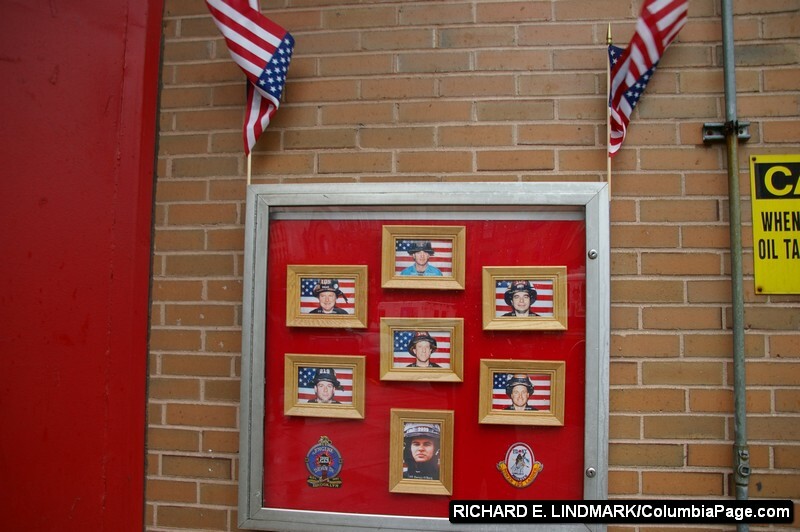 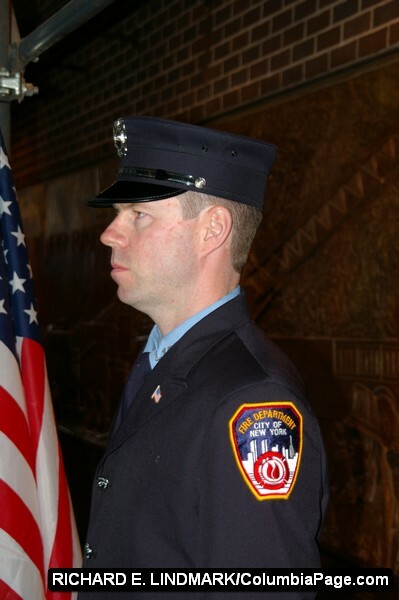 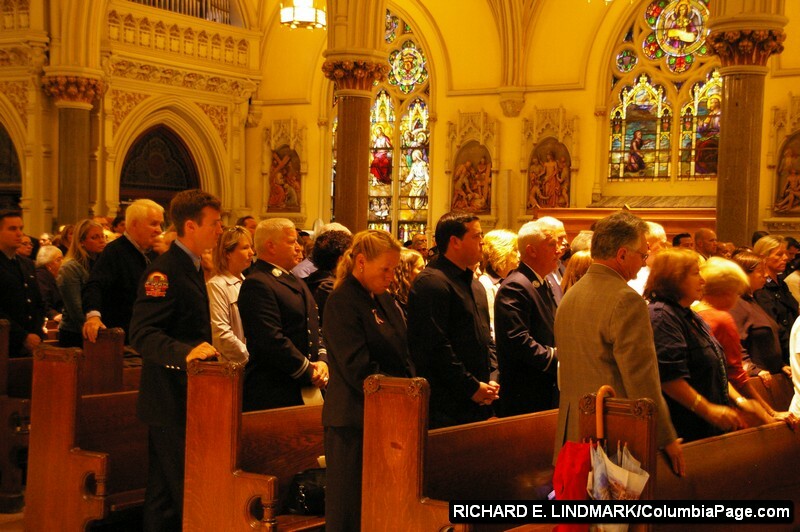 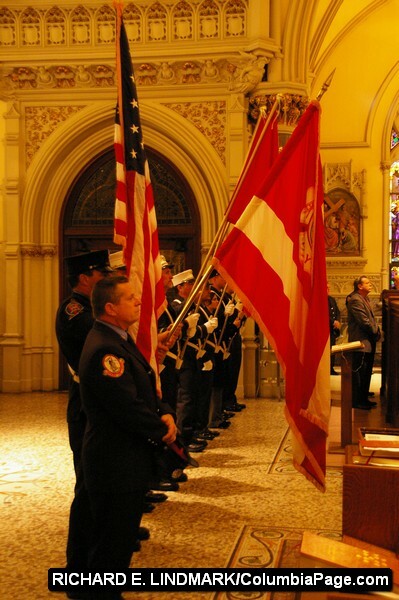 Seven firefighters carried seven department flags from Ground Zero, across the Brooklyn Bridge to the church. They were joined by other New York City firefighters and other firefighters from as far away as California. 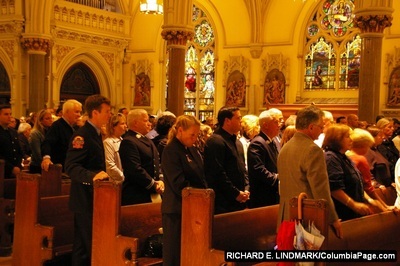 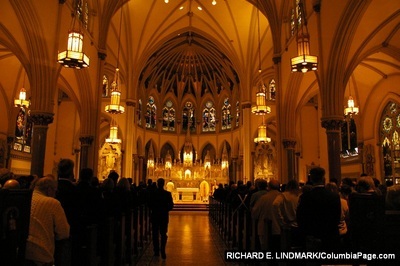 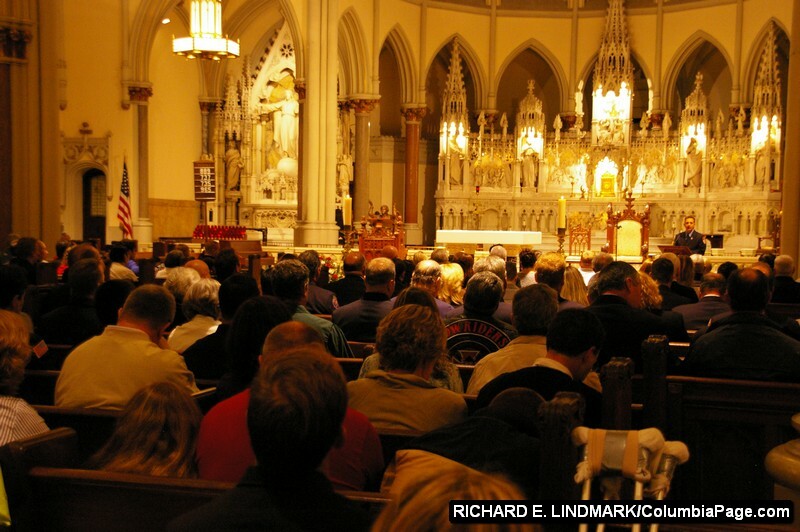 At the church the service is solemn. 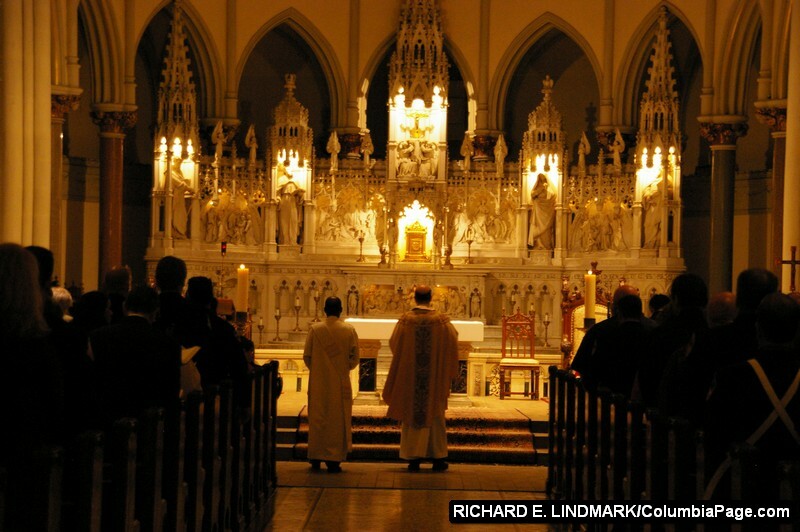 Scripture is read, songs are sung, prayers are said, communion is offered. I witness people hugging and crying. 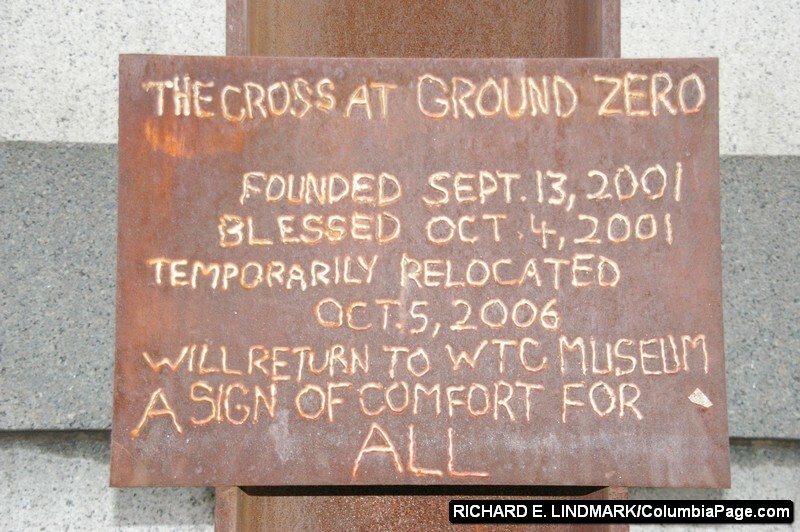 Even after eight years there is pain. 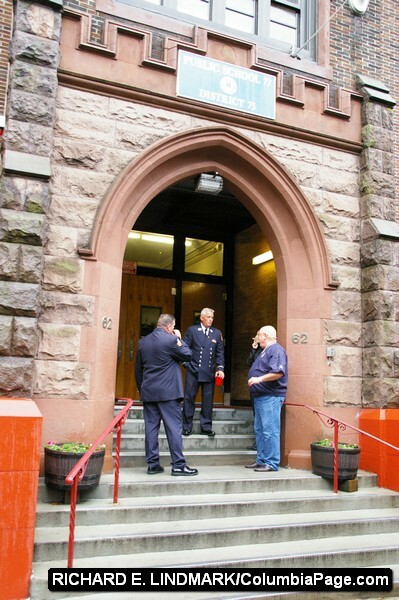 After the service we are invited to PS 77 at 62 Park Place. There we have lunch with firefighters from all over. 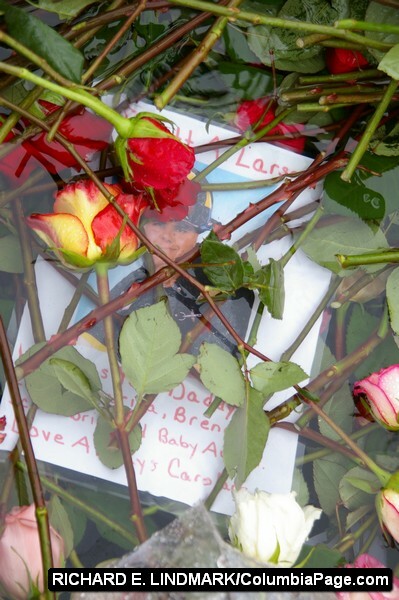 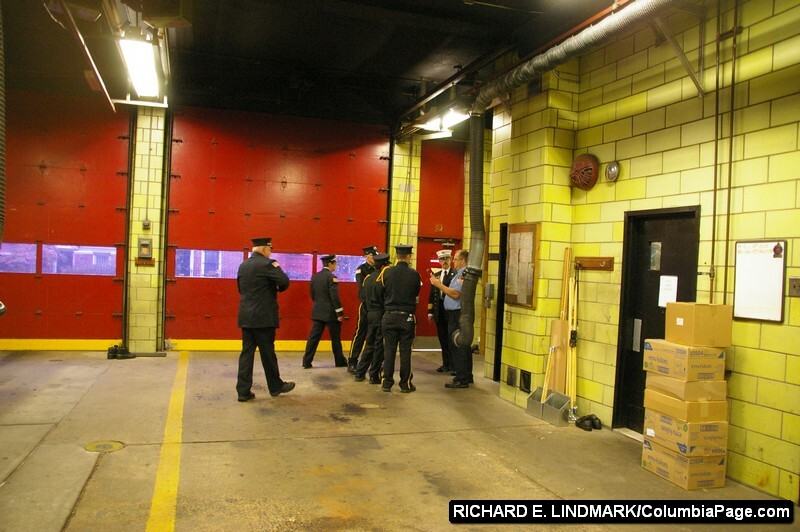 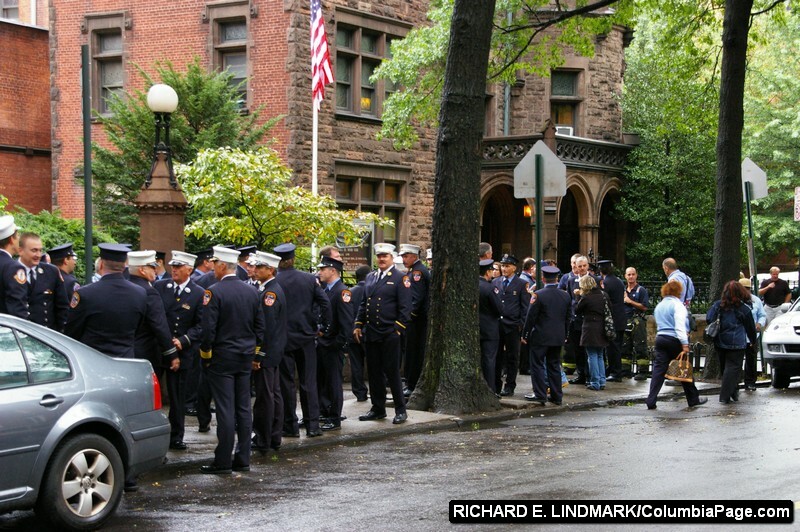 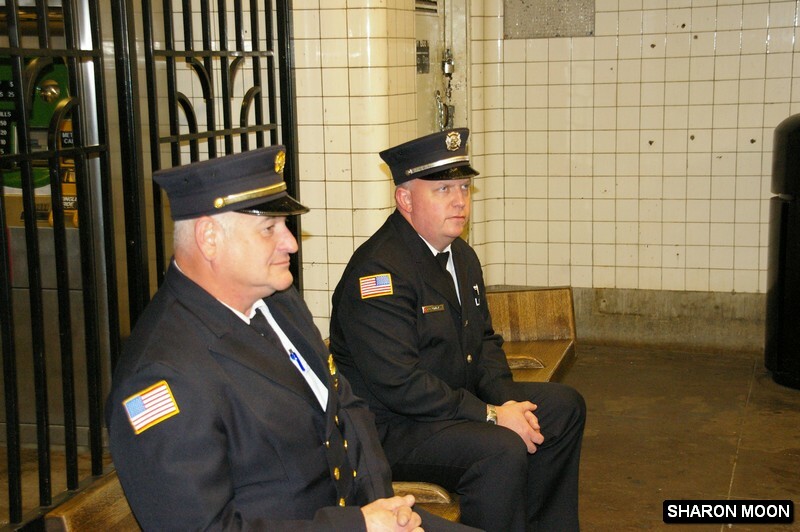 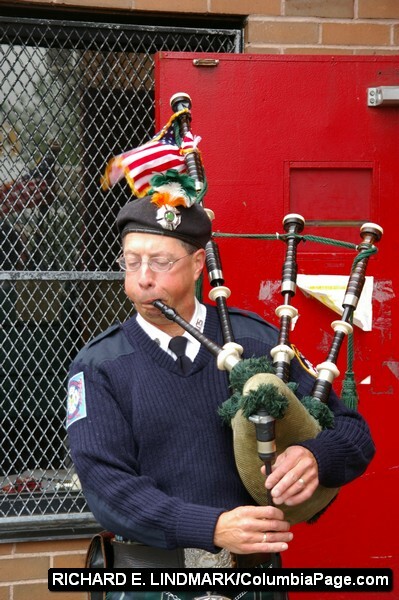 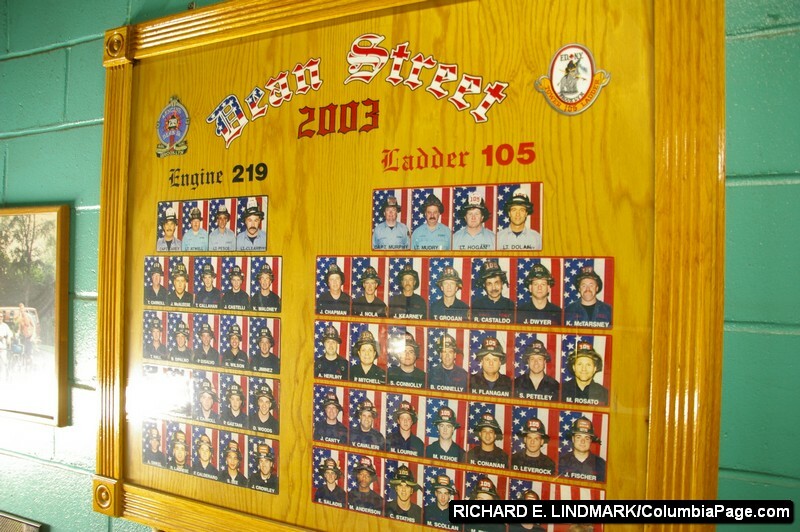 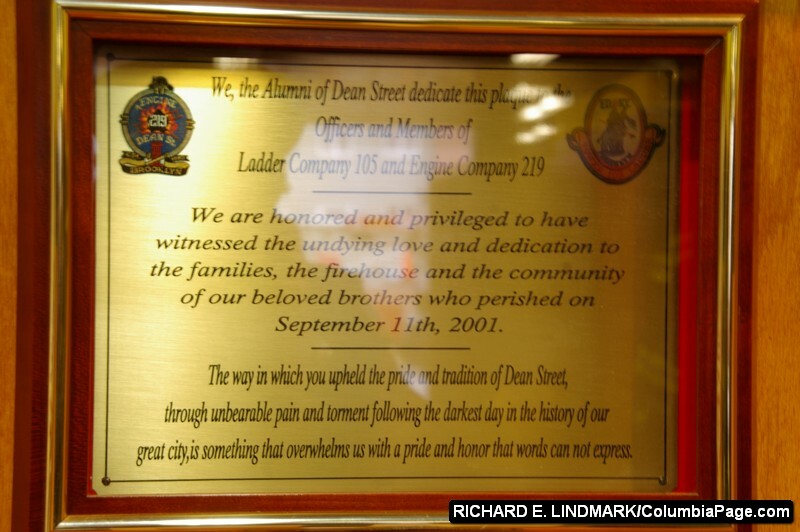 We return to the Dean Street Fire Station and say goodbye to some of the firefighters there. 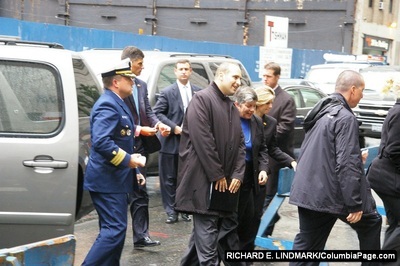 Handshakes and business cards are exchanged. 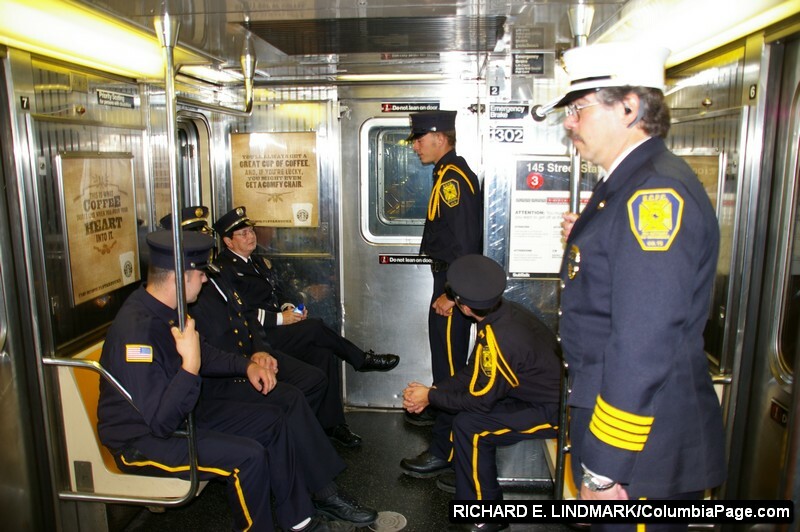 We once again board the subway and head to Manhattan. 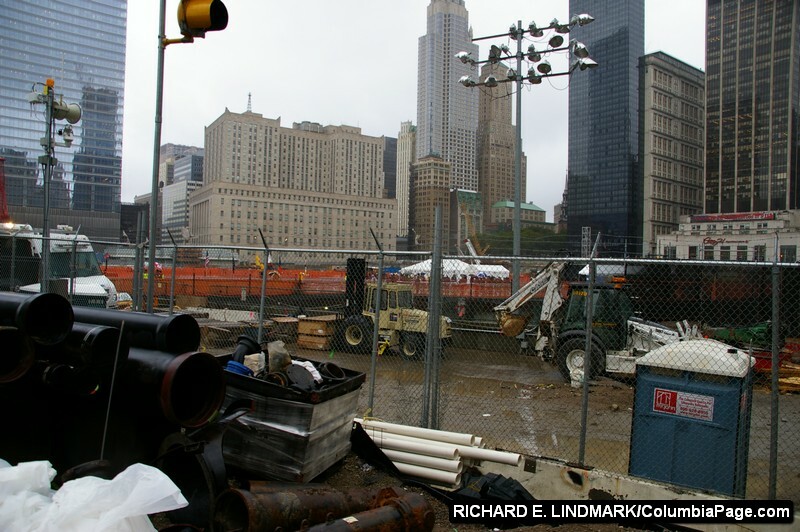 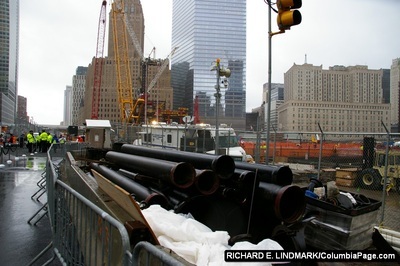 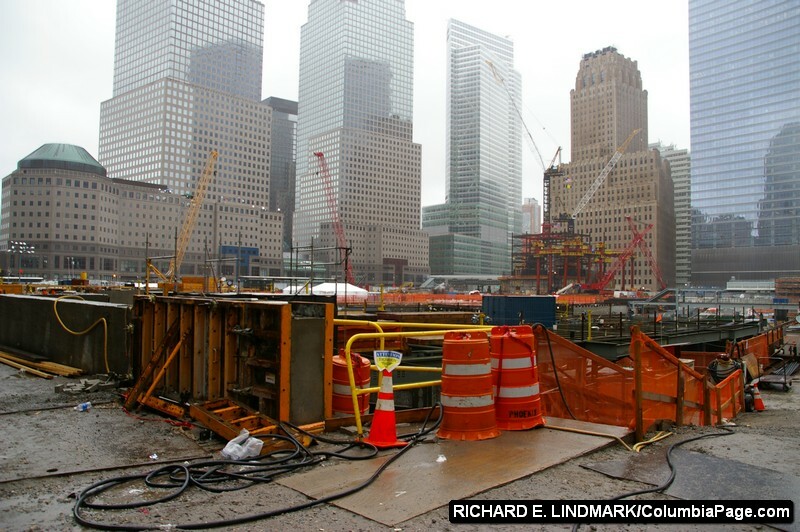 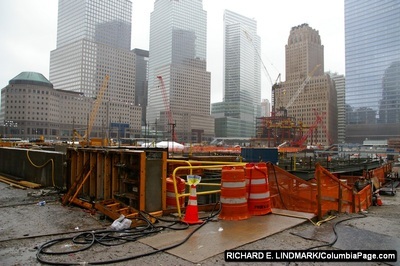 We are going to Ground Zero the site of were the twin towers once stood. 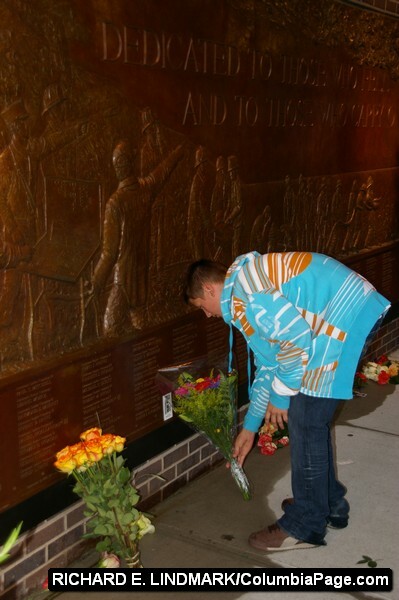 As we arrive we are given flowers. 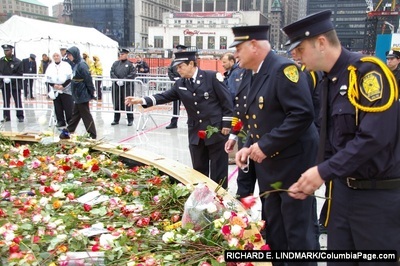 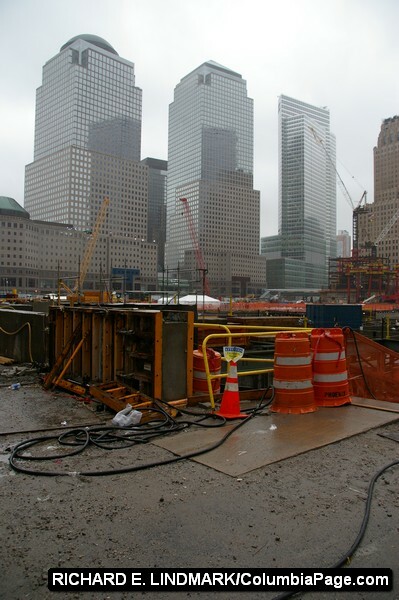 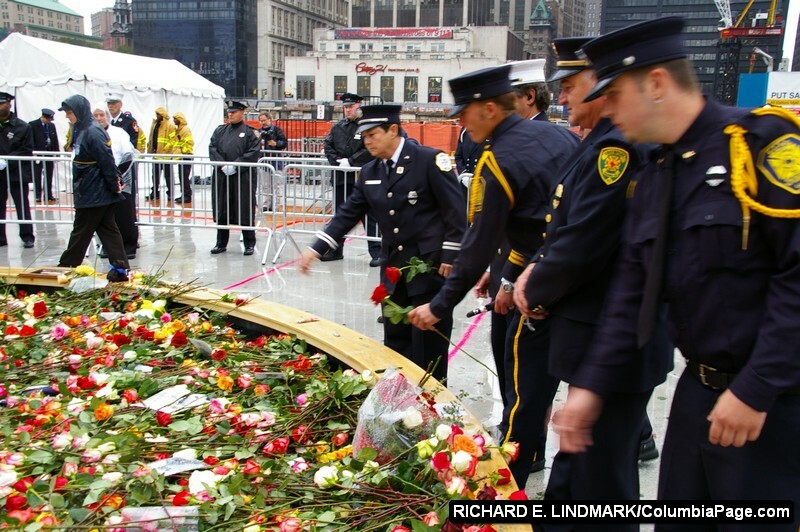 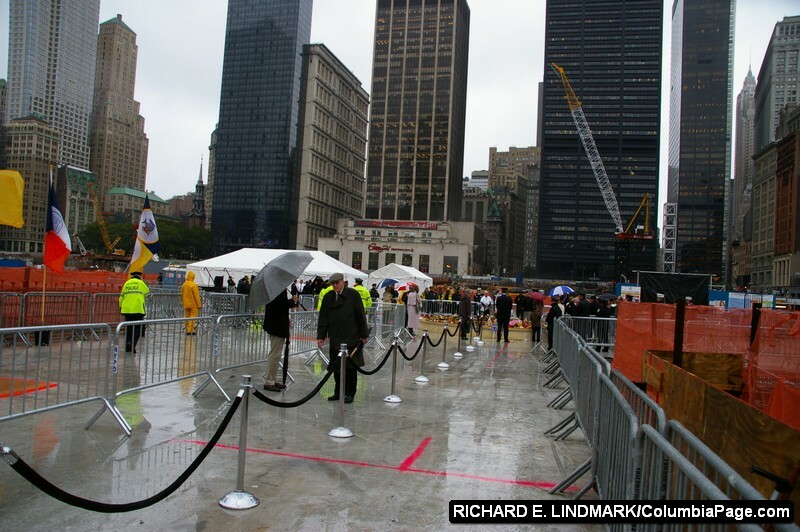 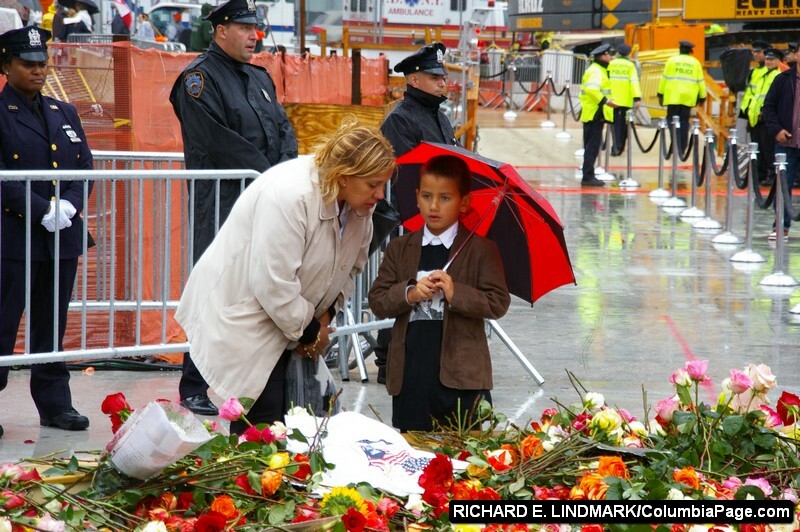 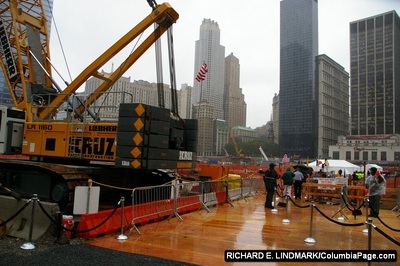 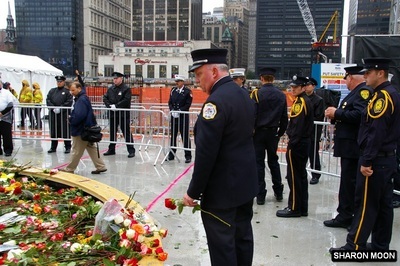 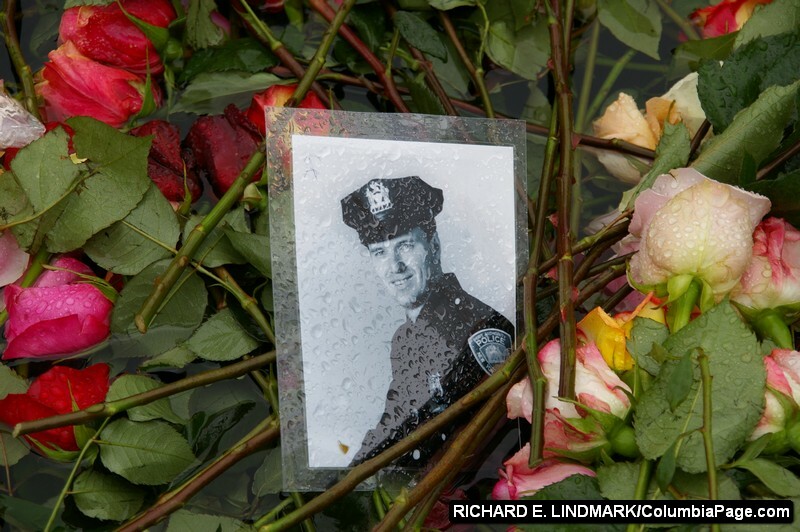 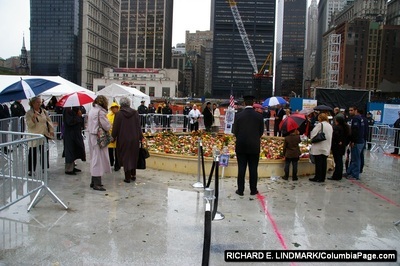 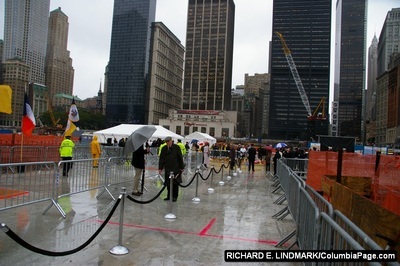 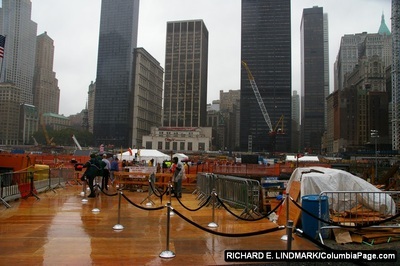 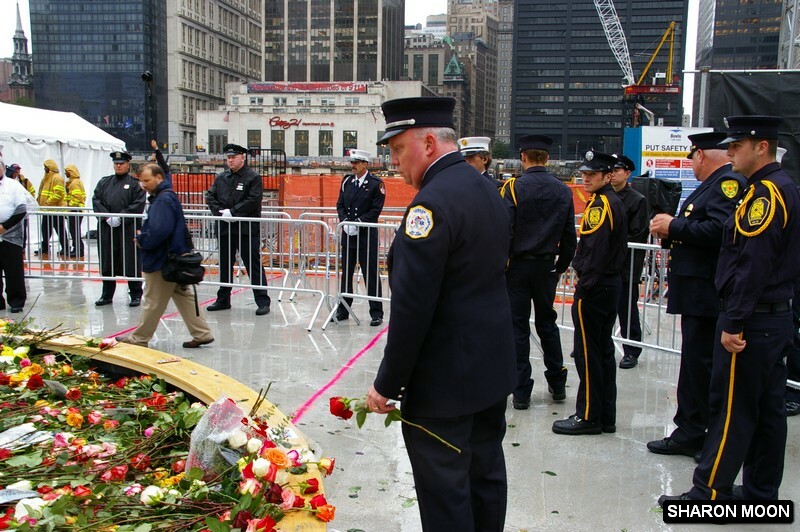 The flowers are to be placed at the reflection pool that is at the site where the South Tower stood. 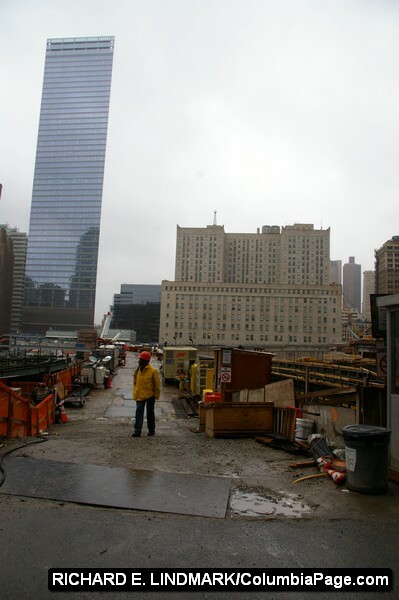 As I arrive in front of the pool it hits me as it has in past years that I have come. 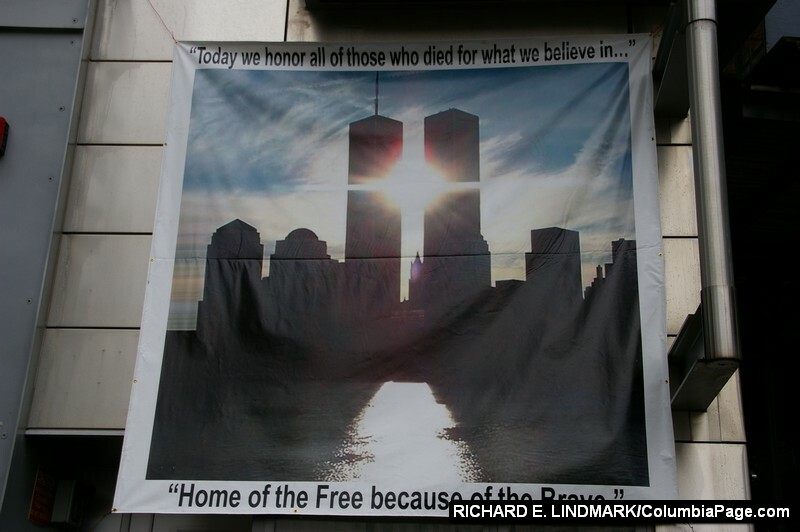 I realize this is the site where thousands, yes thousands of people have died. 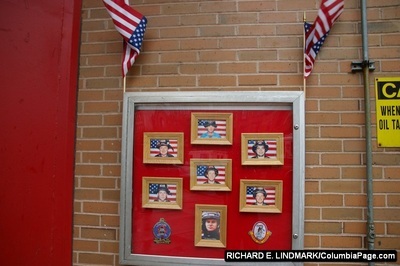 There are photos left at the pool. 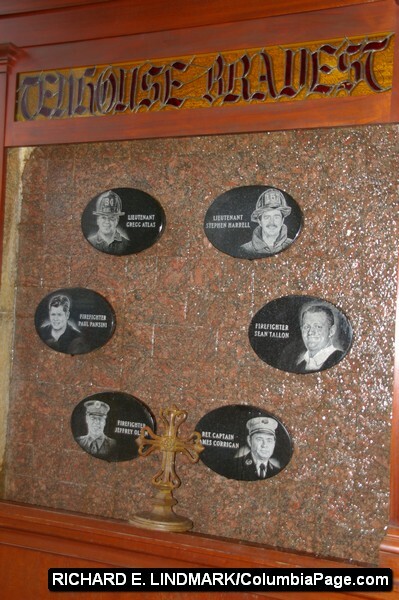 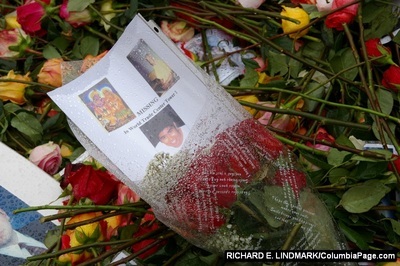 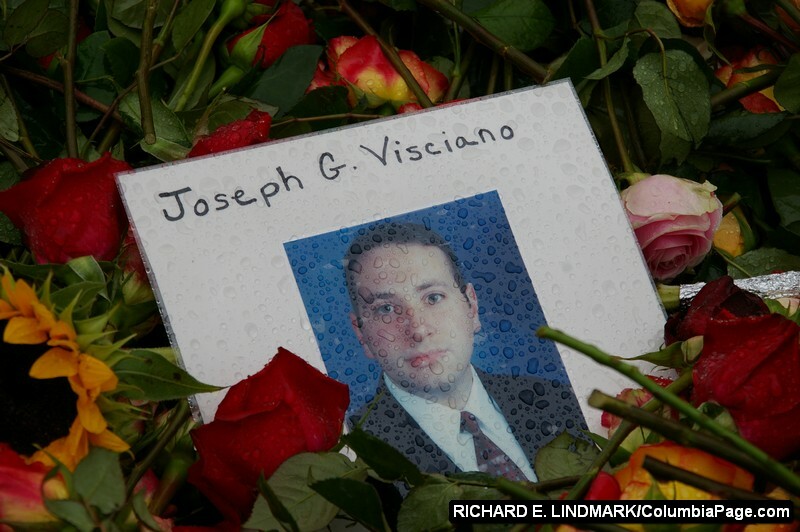 Photos of some of the victims. As I look at them some of them I choke up. 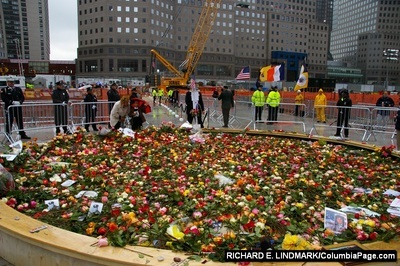 I say a silent prayer and gently toss a rose that lands with the hundreds of others. 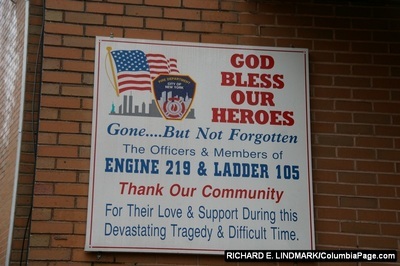 I try hold back tears, but I do shed a few. 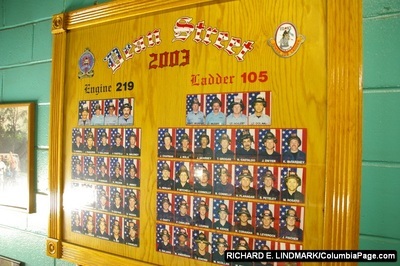 I shed them for 343 brothers that I never knew . 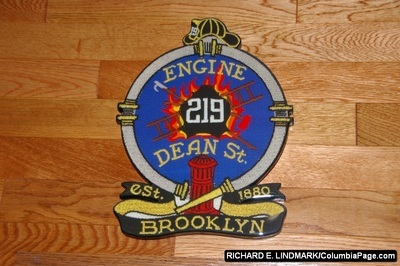 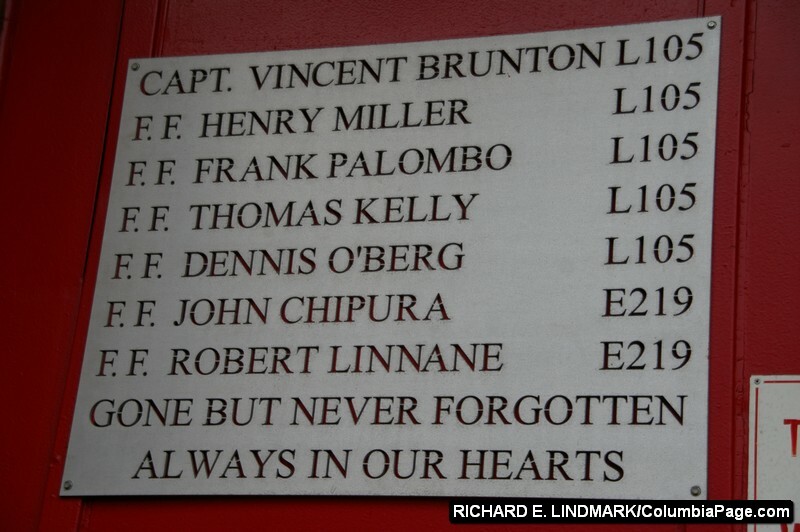 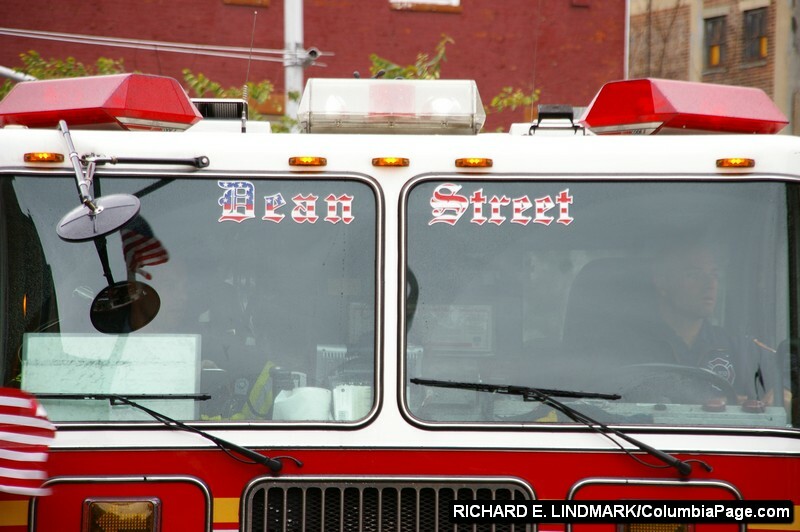 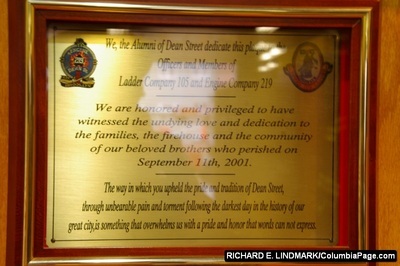 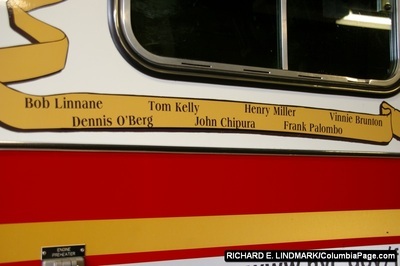 Seven of the brothers were from Engine 219 / Ladder 105 from Dean Street Brooklyn. 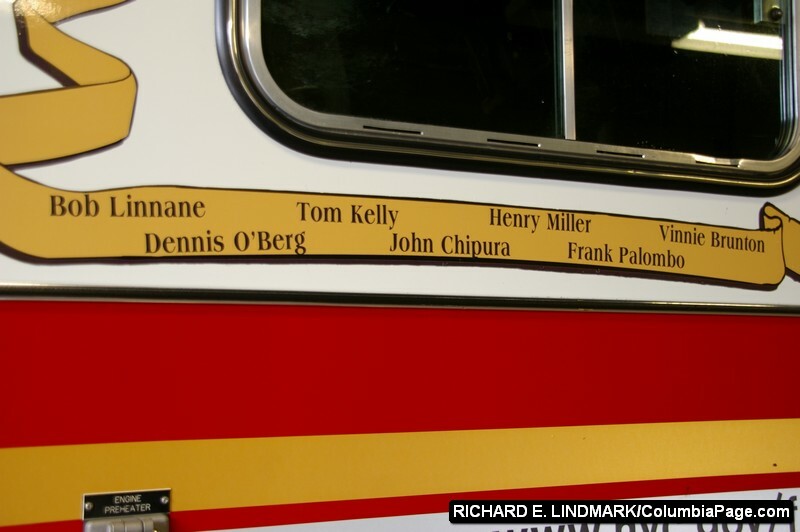 Captain Vincent Brunton, FF Henry Miller, FF Frank Palombo, LT Thomas Kelly, FF John Chipura, FF Dennis O'Berg, and FF Robert Linnane. 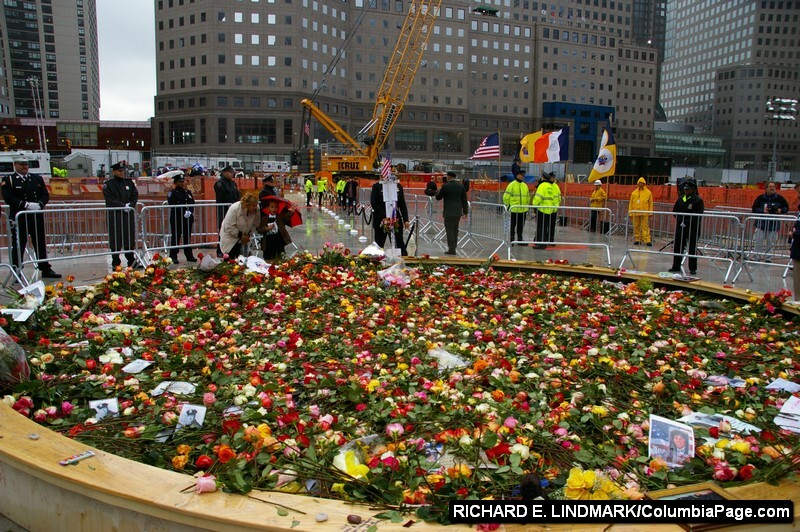 May they and all the victims of this act of terrorism rest in peace. 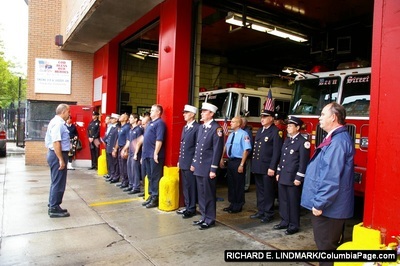 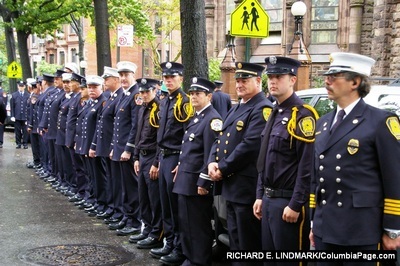 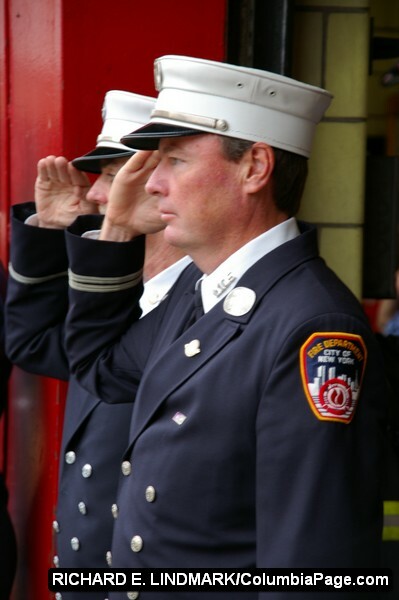 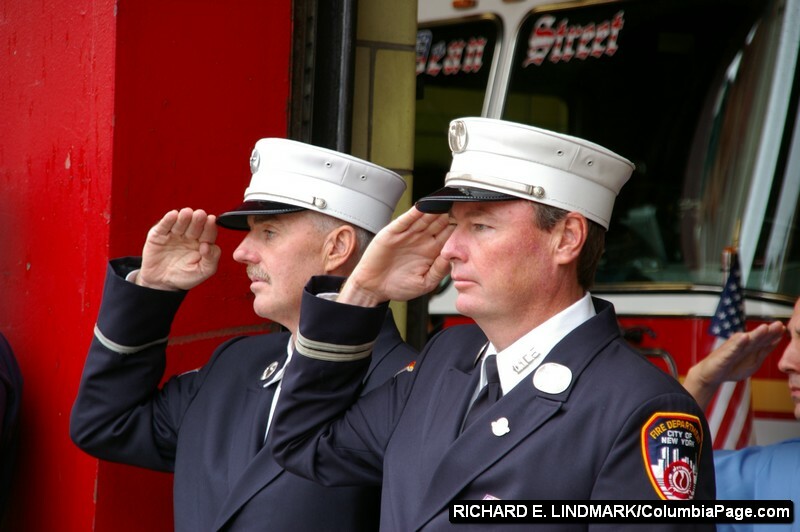 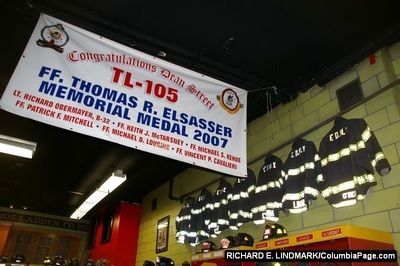 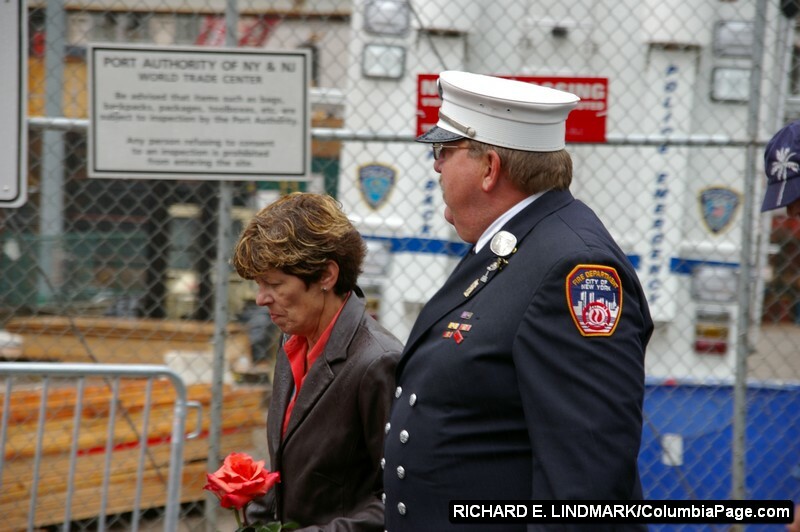 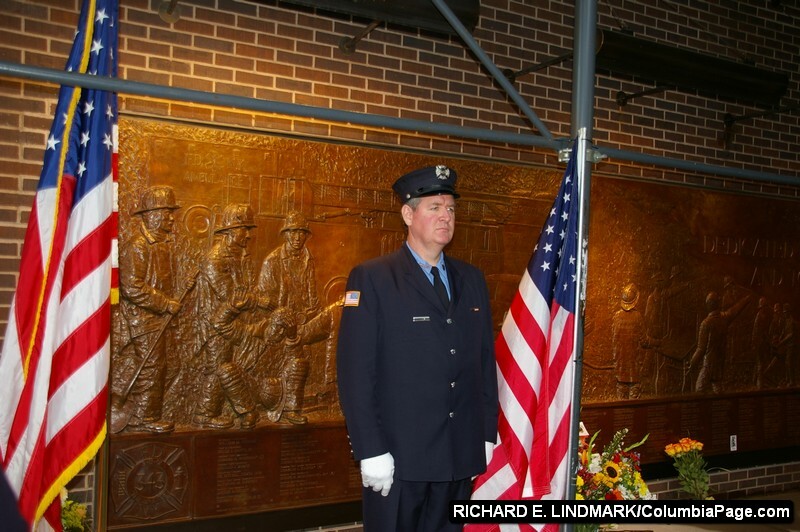 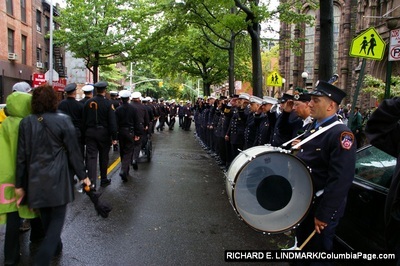 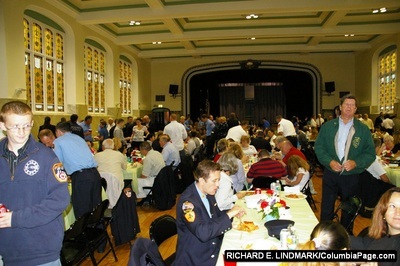 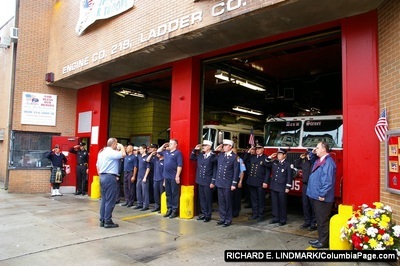 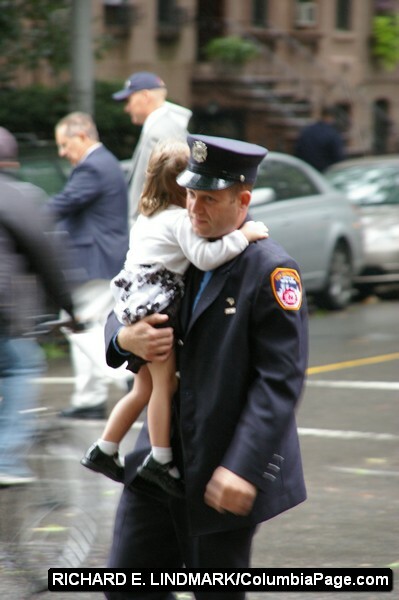 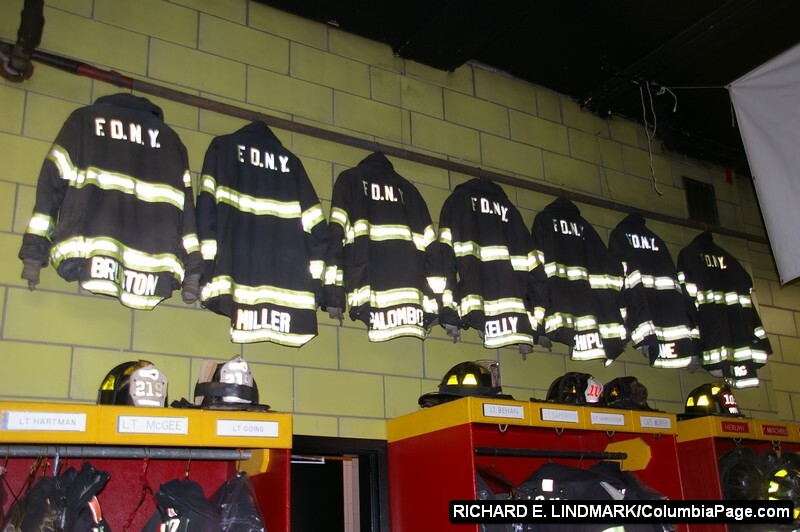 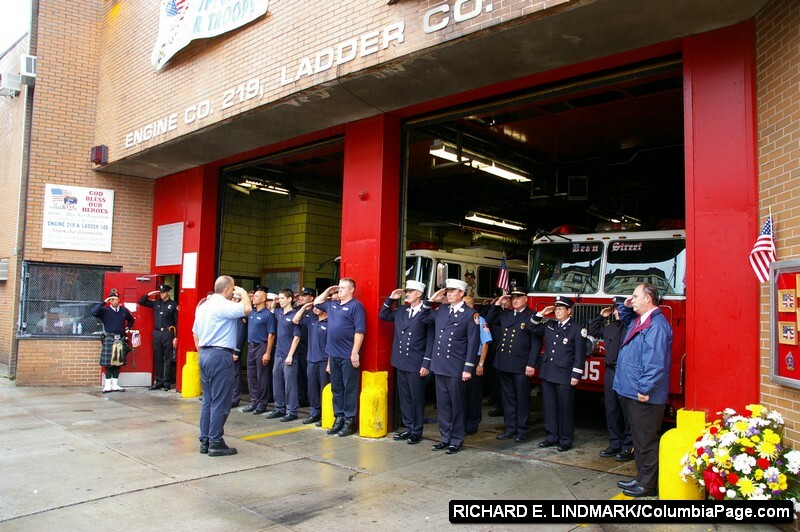 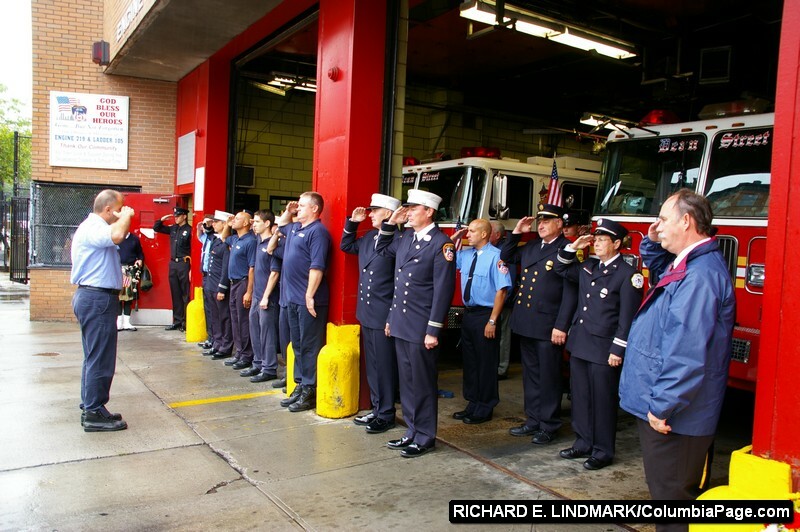 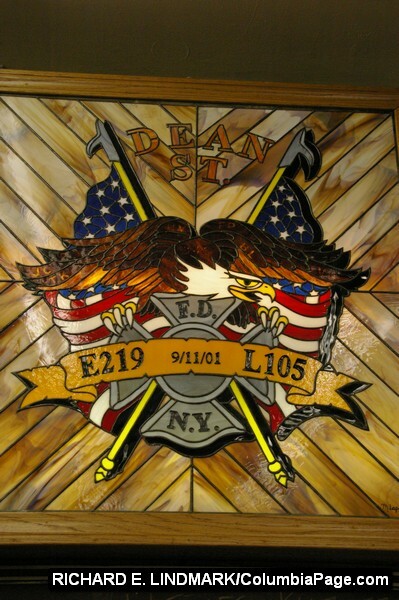 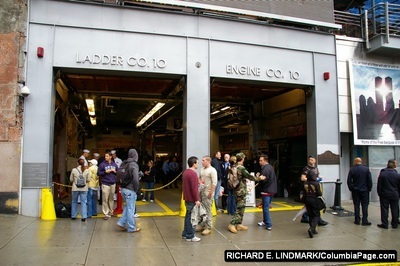 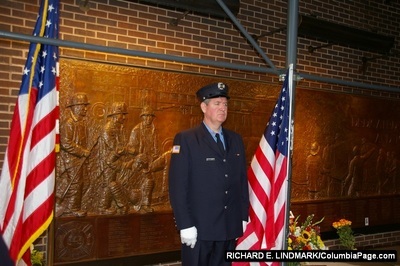 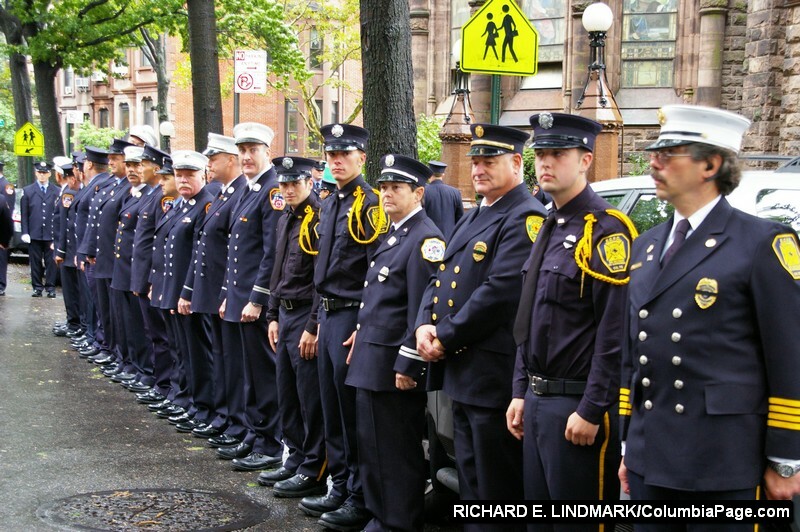 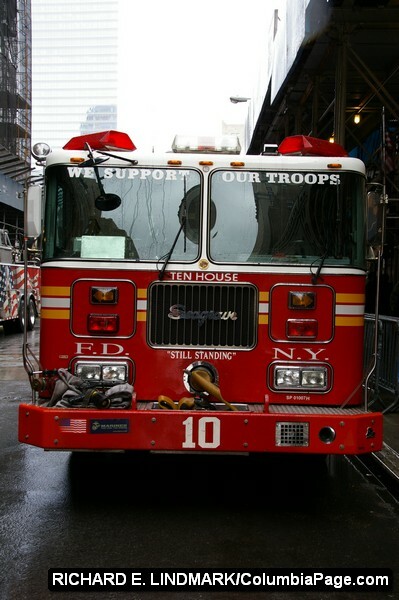 To the men and women of FDNY Ladder Co. 105 and Engine Co. 219 from all of us who attended, THANK YOU for everything. 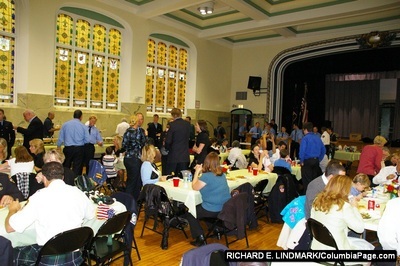 Special thanks to FF Regina Wilson for the invitation.